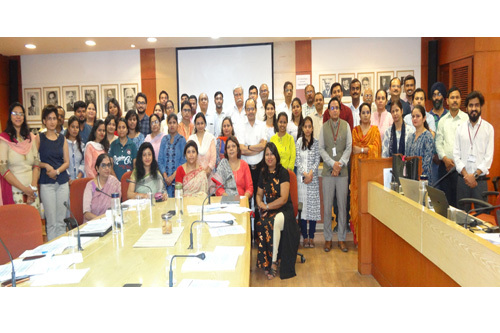 CDSA conducted Good Clinical Practice (GCP) and Good Clinical Laboratory Practice (GCLP) programs at the ICMR Headquarters, New Delhi on April 11th and 12th, 2019. 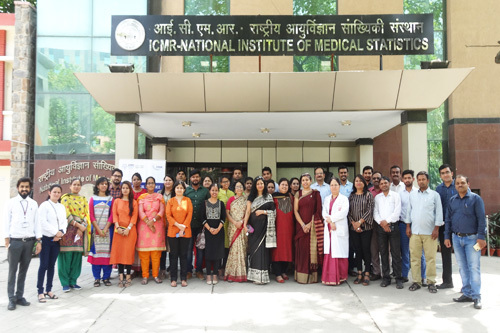 Both the programs were attended by participants from ICMR Hqs, all the team members of ICMR’s POD-TB Vaccine project and seven ICMR centres across India; NARI, Pune; GTB, Mumbai; NITRD, Delhi; NIRT, Chennai; NIRT, Madurai; RMRC, Bhubaneshwar; NTI, Bangalore. 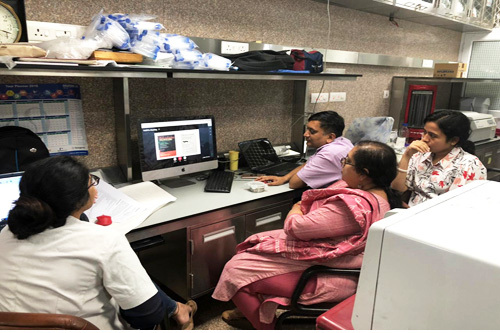 The interactive programs apprised all team members of ICMR’s POD-TB Vaccine project to understand their roles and responsibilities better by adapting the GxPs. 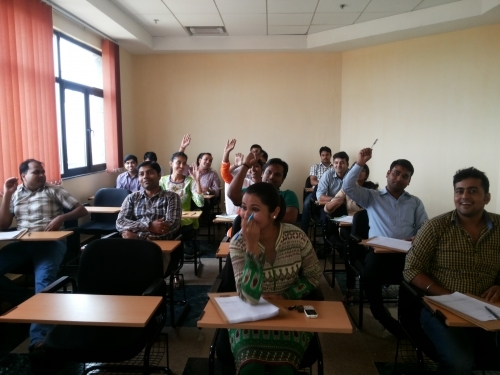 All participants gave an online exit assessment and all their questions were addressed by the faculty. 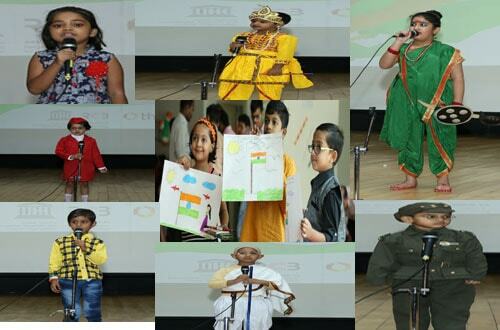 It was interesting to see how each group presented their SOPs during this program. CDSA and ICMR have joined hands to work in many areas and capability building in biomedical research is one of them. 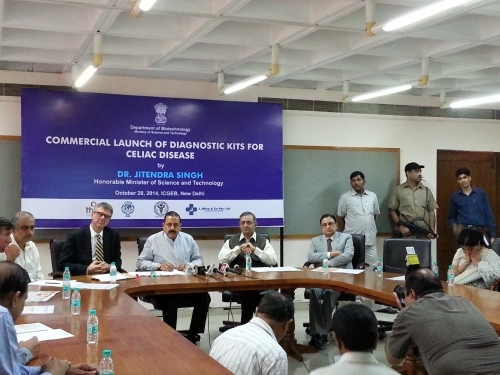 ICMR pioneered the GCLP Guidelines by releasing it in 2008. It will be a great step forward when the participants adopt these guidelines with the new quality updates. Adding to her long list of accomplishments, Prof. Gagandeep Kang, our current Executive Director, was elected as a Fellow of The Royal Society (FRS) for 2019. The election to the prestigious society is especially important as this makes Prof. Kang the first woman working in India to be elected to the Society in the 400+ years of its history. 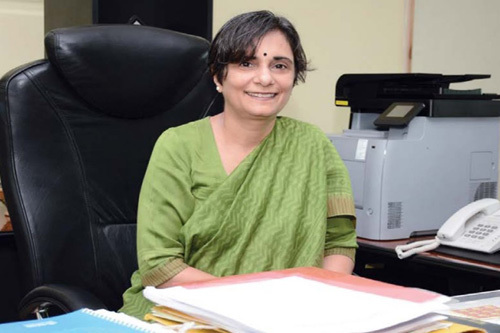 She has been awarded the fellowship in recognition of her contributions to vaccine development in India and establishment of training programs in clinical translational medicine. 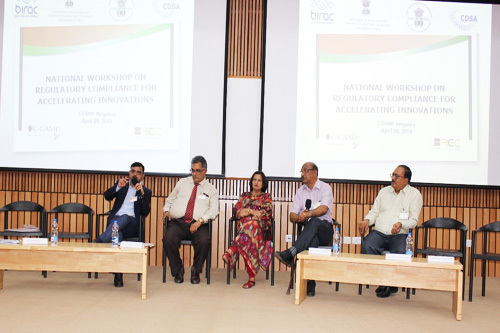 The Department of Biotechnology (DBT) and Central Drugs Standard Control Organisation (CDSCO) along with Biotechnology Industry Research Assistance Council (BIRAC) and CDSA had organized a one-day interactive program, “National workshop on regulatory compliance for accelerating innovations” on April 09, 2019 with Centre for Cellular And Molecular Platforms (C-CAMP), Bangalore. This was one of the six national programs planned across the nation. 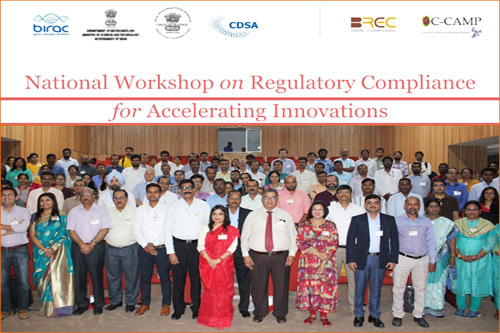 The workshop was attended by senior representatives from Government organisations, academia, medical device industry, in vitro diagnostics, new drugs, biopharma, phytopharma representing various start-ups, hospitals, institutes etc. There were total 86 participants representing 80 institutions who attended the workshop. There were 17 faculties including senior experts, present and former regulators from CDSCO; BIS (Bureau of Indian Standards); CDSA, THSTI (Translational Health Science & Technology Institute); NABCB (National Accreditation Board for Certification Bodies), QCI (Quality Council of India) and NIB (National Institute of Biologicals). 12 CDSCO senior officers attended this program, which included Drugs Controller, Government of Karnataka; 2 Deputy Drugs Controller and 2 Assistant Drugs Controller. There were three major themes: medical devices, new drugs & phyto-pharma, and biopharma. The regulators addressed all questions asked by the participants. Biopharma was attended by 21, new drug and phytopharmaceuticals by 26 and medical devices and in vitro diagnostics by 39 participants respectively. 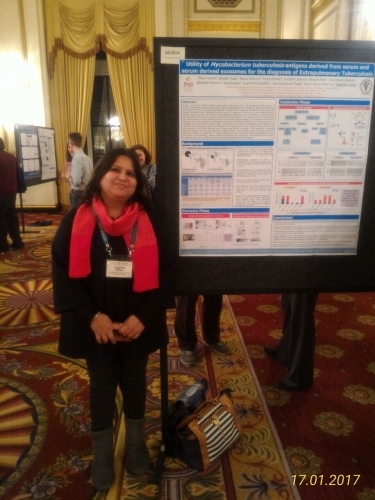 Suyasha Roy, PhD student of Dr Amit Awasthi (Immunobiology Laboratory, CHME) has received Travel Award from Federation of Clinical Immunology Societies (FOCIS) for her meritorious abstract scored among the highest by a blinded external review committee of immunologists at FOCIS Advanced Course in Basic and Clinical Immunology held from 26th-29th March, 2019 at Shiv Vilas Resort, Jaipur, Rajasthan, India. 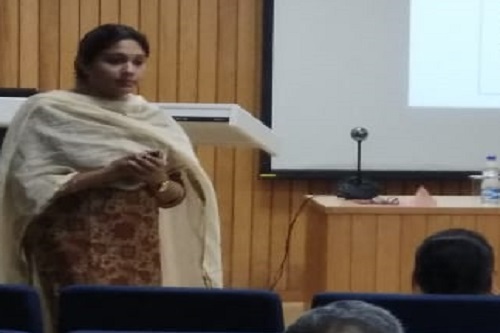 Ms. Suyasha has also received IIS Bursary Award from Indian Immunology Society (IIS) for Poster Presentation and was the only PhD student from India to receive both FOCIS Travel Award and IIS Bursary Award at the event. THSTI organized the second edition of the course on Immunology titled "Overview of Cellular and Molecular Immunology" from 1st to 3rd April 2019. This course is designed to cover basic and recent advances in the field of Immunology. Distinguished immunology researcher and teacher, Dr. Shiv Pillai who is currently a Professor at Harvard Medical School, Boston, USA delivered most of the lectures. 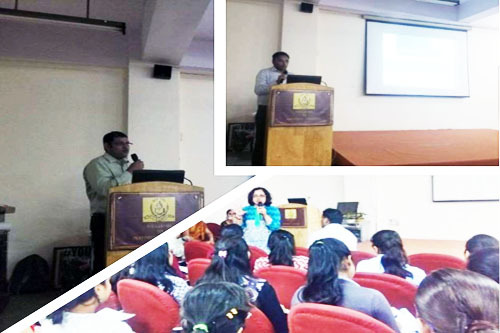 Dr. Vineet Ahuja who is Professor at the Dept of Gastroenterology of AIIMS, Delhi along with Dr. Amit Awasthi, Associate Professor at THSTI also delivered lectures. 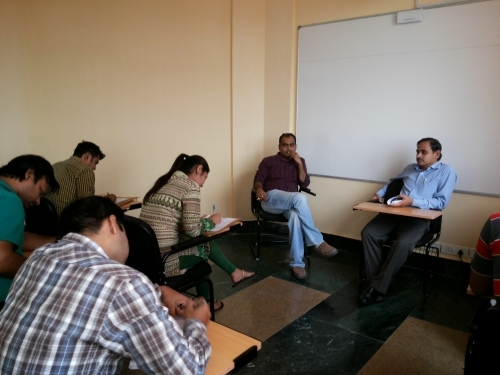 Dr. Awasthi was also the faculty-in-charge for the course. 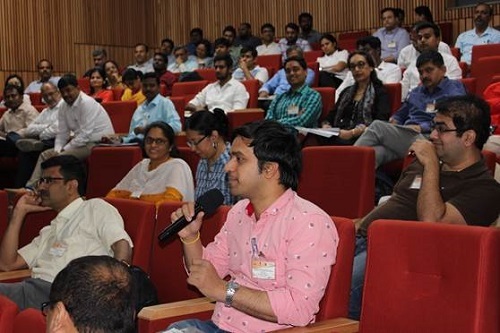 This year saw more than 250 participants comprising faculty members, research fellows and PhD students from institutes in NCR and across the country. 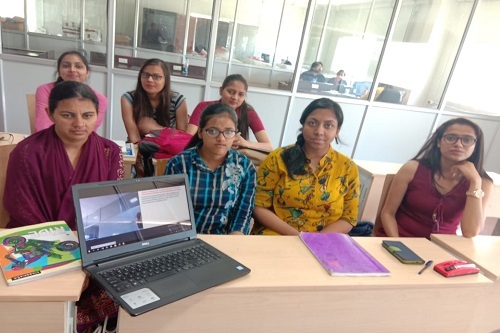 One of the highlights of the course this year was that researchers at Banaras Hindu University, AIIMS Delhi, PGIMER Chandigarh, SRM Sonipat, Tezpur University and others could attend the course by joining a live streaming session. Two scientists, Drs. John Osei Sekyere and Nontuthuko Maningi from the Department of Medical Microbiology, University of Pretoria, South Africa visited Dr. Nisheeth Agarwal's laboratory for a two-week training on CRISPRi-Cas 9 gene silencing from March 17th to March 30th 2019. The two researchers came as part of an effort to establish new collaboration that will provide positive impetus for future exchanges and joint research collaborations. This training also aimed at enabling them to train their students back in South Africa with CRISPR-Cas9 and CRISPRi-Cas9 genome editing technique. Their visit was funded by an Africa - India Mobility Fund (AIMF) grant. Also read this piece in the Delhi edition of Millenium Post dated 27th March 2019. 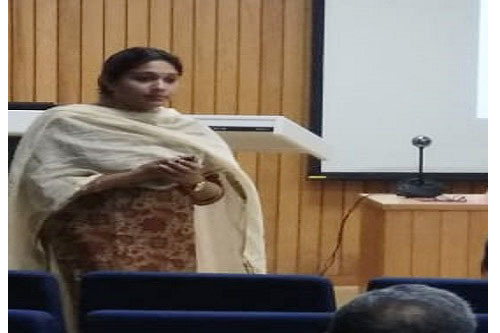 Ms. Hina Lateef Nizami and Mr. Parmeshwar Katare, PhD students with Dr. Sanjay K. Banerjee, have been awarded for poster and oral presentation (respectively) at the International Academy of Cardiovascular Sciences (IACS) India section 2019; International Conference on Translational Research in Cardiovascular Sciences. Ms. Hina received the N.S. Dhalla Best Poster award, while Mr. Parmeshwar bagged the award for being one of the finalists for D.K. Agrawal Young Investigator award session. 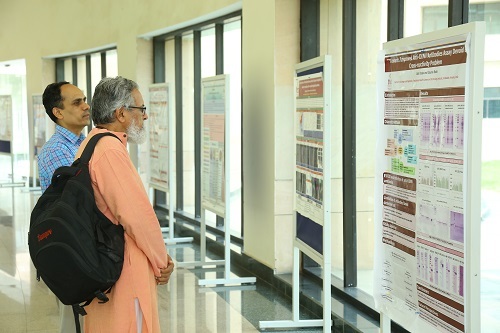 The meeting, organised by Sri Jayadeva Instititute of Cardiovascular Sciences and Research, was held from 15th to 17th February 2019 at NIMHANS, Bengaluru. As the scientific community celebrated National Science Day, a group of women students and research fellows from THSTI visited K.L. 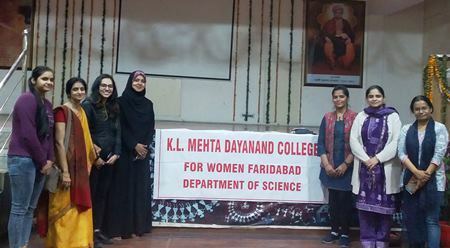 Mehta Dayanand College for Women in Faridabad. 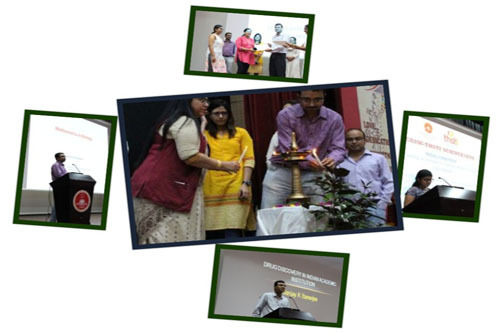 Dr. Harleen Khurana (RA with Dr. Ramandeep Singh), Ms. Hina Lateef Nizami (PhD student with Dr. Sanjay Banerjee), Ms. Ojasvi Mehta (SRF with Dr. Bhabatosh Das), Ms. Anvita Chaudhary (SRF with Dr. Ajay Kumar) and Ms. Neha Yadav (JRF with Dr. Pallavi Kshetrapal) formed the group. 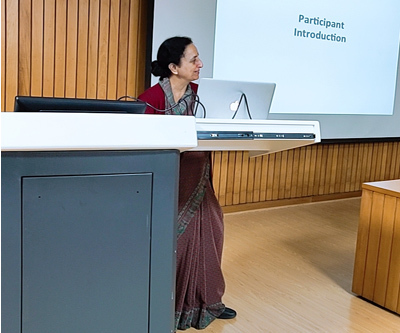 Dr. Pallavi Kshetrapal, who is a member of THSTI's Science Setu committee was also a part of the group and began the talks by introducing our maternal and child health program. The students and fellows eloquently communicated their work to a crowd of about 300 undergraduate students from different streams of biological sciences. 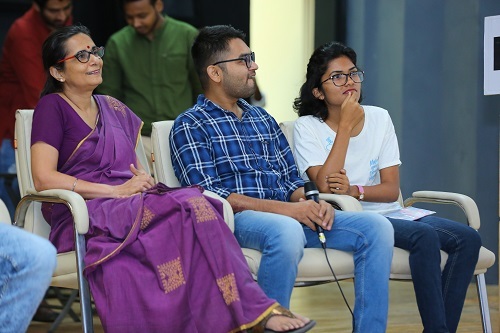 The talks were followed by a short session wherein the college students posed questions regarding higher studies in science and alternative careers in science. This is the first girls-teaching-girls program under science setu and we wish to have more of such programs in future celebrating women in science. The Union Minister for Science & Technology announced key missions at the foundation day ceremony of DBT including Atal JaiAnusandhan Biotech Mission - Undertaking Nationally Relevant Technology Innovation (UNaTI), which is expected to transform Health, Agriculture and Energy sectors during the next five years. This mission includes two of our collaborative ventures - GARBH-Ini and IndCEPI. While, GARBH-ini is a mission to promote maternal and child health and develop prediction tools for pre-term berth, IndCEPI is aimed to develop affordable vaccines for endemic diseases. DBT celebrated its 33rd Foundation Day in New Delhi with "Celebrating Biotechnology: Building Indian as an Innovation Nation" as their theme. The Union Minister emphasized the role of Department of Biotechnology during the last 33 years in creating a large-scale impact across the multiple sectors by development and commercialization of affordable solutions for healthcare, improved crop varieties, animal diagnostics and technology for generation of clean energy. He also highlighted the progress made in the area of capacity building, generation of new knowledge, translational research and in nurturing of Biotechnology startup ecosystem. 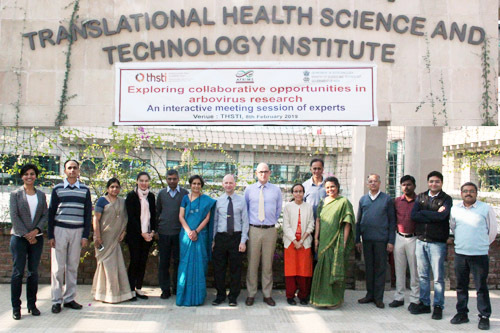 THSTI will collaborate with Indian Institute of Technology-Madras (IIT-M) to apply advanced analytical approaches for predicting pregnancy outcomes and childhood mortality and morbidity. 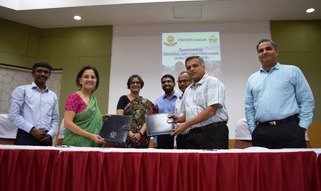 The Research Collaboration Agreement was signed on 22nd February 2019 during the THSTI - IIT-M Conclave on 'Transforming Maternal and Child Healthcare using Data Science'. The collaboration will be spearheaded by the interdisciplinary Group for Advanced Research on Birth Outcomes - DBT India Initiative (GARBH-Ini) of THSTI and Initiative for Biological Systems Engineering (IBSE) of IIT-M.
THSTI was represented by Prof. Gagandeep Kang, Prof. Shinjini Bhatnagar, Dr. Ramachandran Thiruvengadam and Dr. Bapu Koundinya Desiraju at the conclave. "Our ability to understand, predict and manage human health and disease is changing rapidly with the application of new technologies that can identify changes at organism, organ system, cellular and molecular levels over time by careful study of patients and their outcomes. The analysis of the massive data sets generated by these studies is a critical need for which there has, so far, been limited capacity in India. We look forward to working with the IBSE to address problems in maternal and child health through deep engagement and integration", said Prof. Kang emphasizing the significance of the collaboration with IIT-M.
Dr. Md Jahangir Alam, a Research Associate working under the supervision of Dr. Sanjay K Banerjee, has been awarded the first prize in Poster presentation for his poster titled "Identification of transcription factors perturbed at early stages of heart development during pre-gestational diabetes" at the International Society for Heart Research 2019 (ISHR-2019). 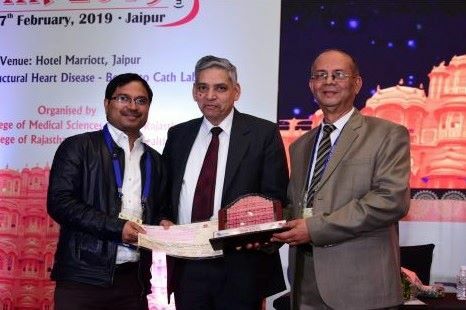 The poster was presented at the 16th Annual conference of ISHR at Jaipur, Rajasthan, from 15th to 17th February, 2019. 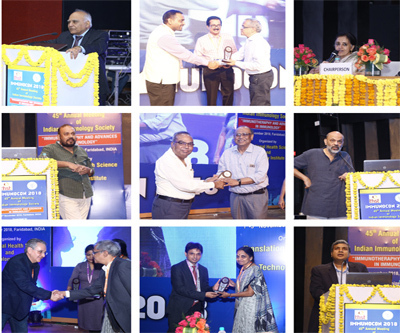 This Indian edition of ISHR conference was organized by Rajasthan University of Health Science (RUHS), Jaipur. 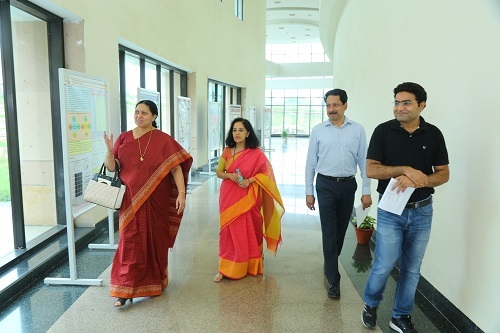 (Picture: *Dr. KK Talwar, President- ISHR India and Dr. VM Katoch, Chairman scientific program- ISHR India 2019)"
Scientists from the Dept of Virology, Armed Forces Research Institute of Medical Sciences (AFRIMS), Bangkok, visited THSTI on 8th February, 2019 to explore collaborative opportunities to develop vaccines and diagnostic devices for arboviral infections. They were joined by experts on arbovirus epidemiology, diagnostics, vaccines and clinical research from premier Indian institutes such as National Institute of Virology, Indian Institute of Science, Christian Medical College, Bharati Vidyapeeth, International Centre for Genetic Engineering and Biotechnology and National Centre for Biological Sciences. 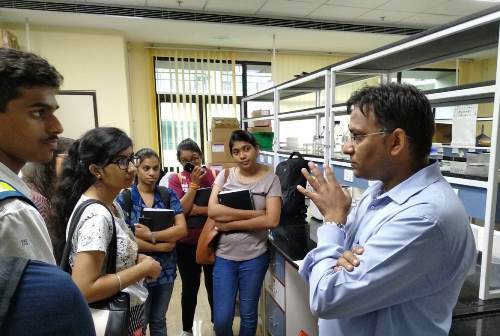 While faculty members and scientists from THSTI briefed the delegates about research infrastructure and capacity at the institute, the international visitors gave an overview of AFRIMS, the status of dengue vaccine development and dengue assays at their institute. 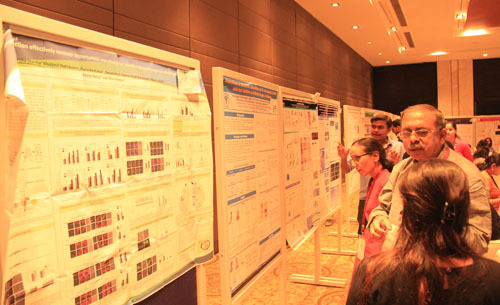 Talks by scientists from national laboratories helped all the experts gain an overview of translational research on arboviruses across Indian labs and a roadmap for future collaborations was discussed. THSTI signed an MoU with Dabur India Ltd for joint development of herbal extracts as therapeutics for Non Alcoholic Fatty Liver Disease (NAFLD). Dabur is a global leader in herbal extract-based healthcare business. THSTI has strong expertise in Drug Discovery and Development. Both the collaborators bring complementary skills for Herbal Extract based drug discovery & development. This is an Academia-Industry collaboration, in tune with joint efforts of DBT with AYUSH for herbal extraction based therapeutic development. The MoU was signed in the presence of officials from both THSTI and Dabur India Ltd. including Prof. Gagandeep Kang (Executive Director) and Dr. Madhu Dikshit (THSTI National Chair). 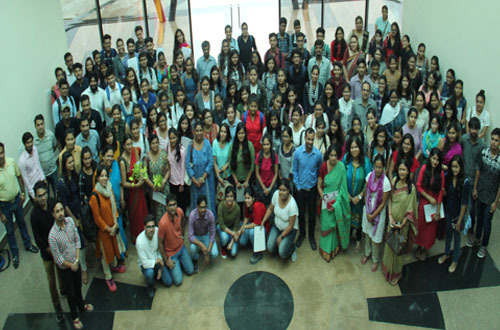 Thirty Students and faculty members from the Bioinformatics Center of Savitribai Phule Pune University visited THSTI on 16th January 2019. Visits and short lectures were arranged with scientists and PhD students and senior research fellows at THSTI are handling bioinformatics analysis for their respective research areas. 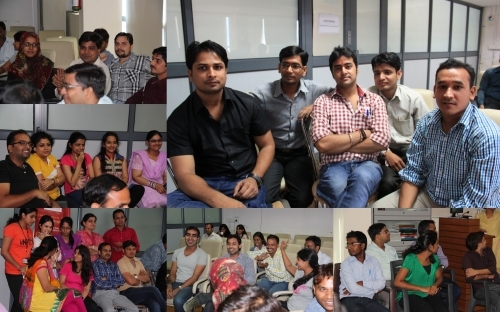 The visit was concluded with a bried Q&A session with our PhD students and senior research fellowsover tea and snacks. 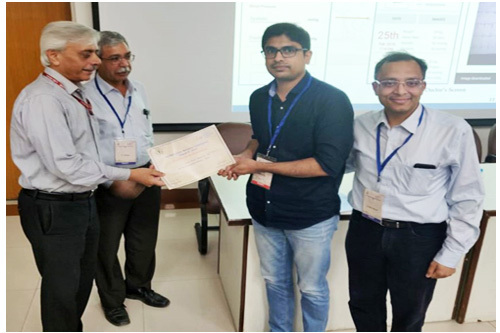 Mr. Abhijit Paul, THSTI PhD student working under the supervision of Dr. Samrat Chatterjee, was selected as the Best Poster Awardee in the section of Mathematical sciences (including statistics) by the Indian Science Congress Association (ISCA), Kolkata. The poster was presented in the 106 th Indian Science Congress held at Lovely Professional University, Phagwara from 3 rd to 7 th January, 2019. Sh. Ashok Mittal, Chief Patron, ISCA 2018-19 Chancellor, Lovely Professional University and Dr. Manoj Chakrabarti, General President, ISCA 2018-19, ICMR Emeritus Medical Scientist, Kolkata gave the award. 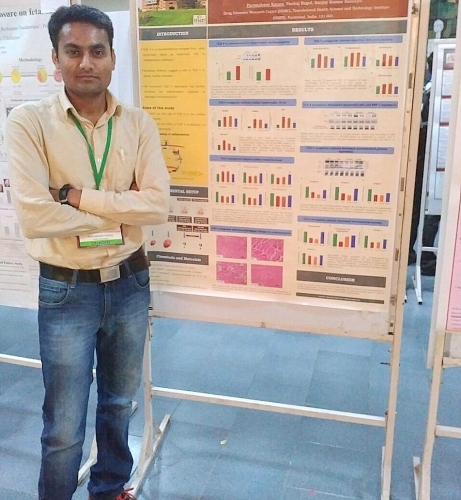 His poster was titled “Finding metabolic reactions responsible for cancer development and potential drug targets against cancer using genome-scale metabolic model”. In a list of 15 major scientific developments comprising technologies that hold a lot of promise – in fields ranging from nanotechnology to space weather that made headlines during 2018, India Science Wire gives a glimpse of important developments reported by Indian scientists during the year. THSTI contributed to two of the developments. Dr. Tarun Sharma's work on highly sensitive and rapid tests for diagnosing TB was covered under the story "Faster diagnostic tests for TB". 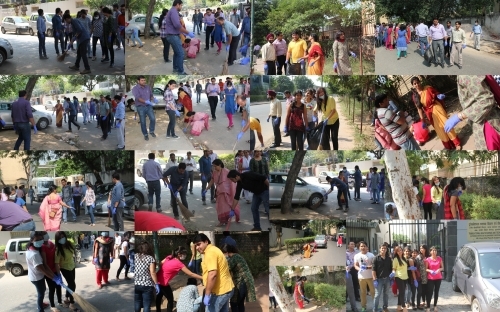 The said work is being conducted in collaboration with AIIMS, Delhi. The RCB-led project unraveling dengue and JE pathogenesis, also made to the list in the story on "Discoveries to tackle Zika, Dengue, JE and Chikungunya" has Dr. Sankar Bhattacharya as a collaborator from THSTI. THSTI and the All India Institute of Medical Sciences (AIIMS), New Delhi signed a Memorandum of Understanding on 03rd December 2018 for the purpose of bridging the clinician-scientist gap through AIIMS-THSTI collaborative platform. The MoU was signed by Dr. Gagandeep Kang, Executive Director, THSTI and Dr. Randeep Guleria, Director, AIIMS in an open house session held at AIIMS, in the presence of Dean (Clinical Research), THSTI; Dean (Academics), Assoc Dean(Academics) Assoc Dean(Research), AIIMS ; Nodal Officer-THSTI, Department of Biotechnology. The mission of collaborative platform is to promote a systematic organized approach to solve the unmet challenges in medical practice and health services by engaging experts from multiple disciplines both within and outside the scope of a problem. This collaborative platform may help in critical identification of the problems faced by the practicing doctors in diverse situations ranging from primary health center to tertiary care super-specialty hospitals and initiate the work for sustainable solution which can be commercialized following the regulatory guidelines. Developing specialized human resources in interdisciplinary domains will be an important goal of the collaborative platform. A joint colloquium series, intra-mural research funding for collaborative proposals, joint summer school/workshop for students are some of the main features of the collaborative platform. 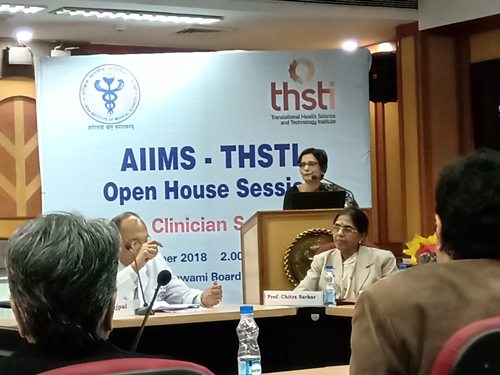 The open house session was themed to throw light on existing successful collaborations and areas where potential future collaborations are possible between investigators from THSTI and AIIMS. 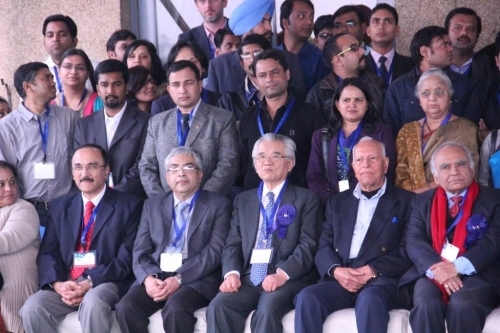 It was attended by faculty and scientists from both the institutes. 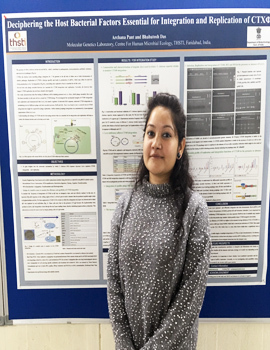 Ms. Archana Pant working with Dr. Bhabatosh Das presented a poster that won her the first prize at BioZest 2018 organized at the South Asian University, New Delhi on 6th December 2018. Her poster was titled "Deciphering the host bacterial factors essential for integration and replication of CTXɸ." The Delhi edition of the popular daily The Indian Express covered THSTI’s study that is evaluating zinc as an adjunct for the treatment of very severe infection in infants. 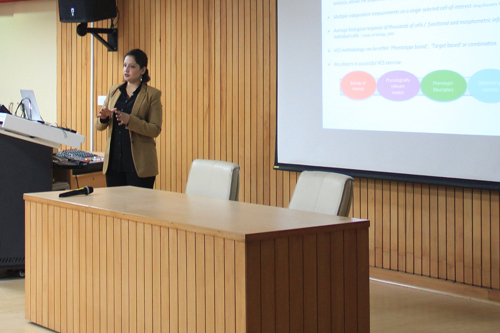 The multi-center and multi-country study is being carried out in collaboration with the University of Bergen, Norway and Tribhuvan University, Nepal and is led by Prof. Shinjini Bhatnagar and Dr. Nitya Wadhwa who are the Principal Investigators of the project. “Our previous study showed significant effects of zinc in reducing risk of treatment failure… our current study in question is whether adjunct treatment with zinc will reduce risk of death in infants with clinical severe infection,” the daily quoted Prof Bhatnagar. Dr. Wadhwa went on to explain the methodology - “The infant, once enrolled, is administered either zinc or placebo for 14 days with the standard treatment. The infant is followed up every 6 hours for signs of recovery or treatment failure. After discharge, the infant continues to be followed up for 12 weeks to measure effects of zinc on 12-week morbidity and mortality”. 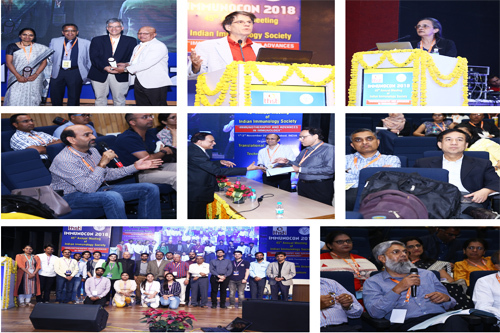 THSTI had the privilege to organize the 45th Annual Meeting of the Indian Immunology Society at its premises in the NCR Biotech Science Cluster, Faridabad from 1st-3rd November 2018. The theme of Immunocon 2018 was Immunotherapy and Advances in Immunology. The inaugural session saw luminaries from the field of Immunology declaring open the three-day event with their experiences of being a part of the society. Four keynote lectures, 11 plenary lectures, lecture sessions on T cell differentiation, clinical immunology, infection and immunity, immune-regulation, innate immunity, poster and discussion sessions were all organized over the span of three days. The institute hosted speakers and participants from national and international organizations. 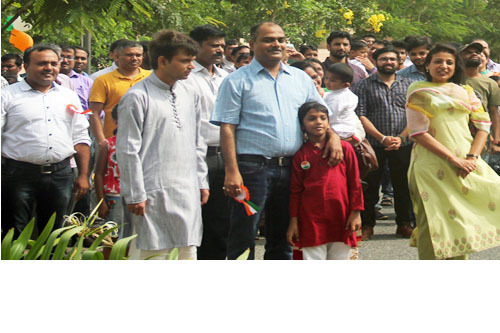 A good footfall with about 500 participants was seen. 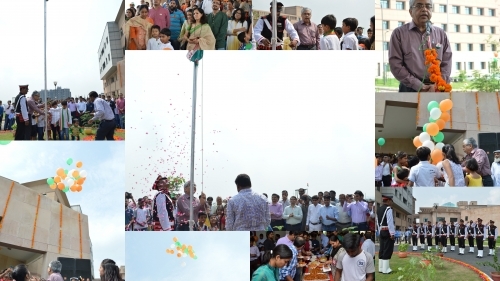 Here are some glimpses from the event. 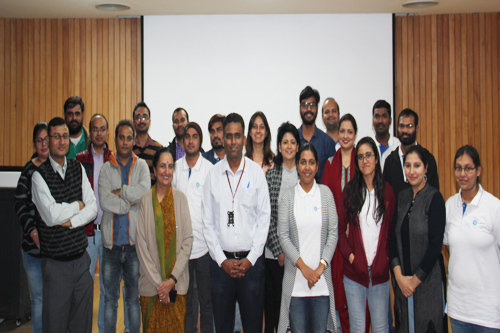 A two-day long workshop on High Content Screening (HCS) and Image analysis was organized by Dr. Shilpa Jamwal and her team for HCS users and researchers with support from GE Healthcare and TECAN/Bioscreen on 27th and 28th November 2018. 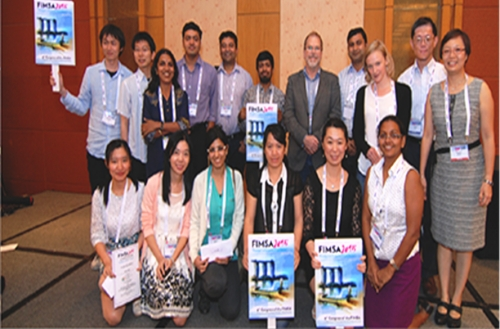 Hands-on sessions were conducted for designing experiments and image analysis in HCS platforms. Researchers from four institutes participated. The participants expressed their satisfaction with the workshop design and shared their interest in attending the upcoming workshops in the series. 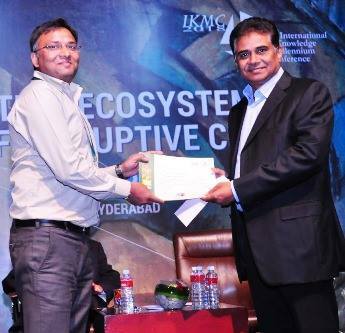 THSTI Spinoff AptaBharat Innovation Pvt Ltd was declared as a winner in the Pharma, Biopharma and Diagnostics category in Startup Exhibition organized by IKP Hyderabad, Dupont and USP. Dr. Tarun Kumar Sharma collected the award on behalf of the company. Dr. Satyabrata Bag, Technical Officer - II with Dr. Bhabatosh Das of the Center for Human Microbial Ecology received the Best Poster Presentation award at the International Symposium on Infectious Diseases held during 12-14th November 2018. His winning poster was titled Insights into the Resistance Traits of Multidrug-Resistant Enteric Pathogens Isolated from India. The Symposium was jointly organized by the Regional Centre for Biotechnology and Jamia Hamdard University. Suyasha Roy pursuing PhD with Dr Amit Awasthi (Immunobiology Laboratory, CHME) has received an International Travel Award from the Australasian Society of Immunology (ASI) for giving an oral presentation on her PhD work at the 7th Federation of Immunological Societies of Asia-Oceania (FIMSA) Congress held from 10th-13th November, 2018 at Mandarin Hotel, Bangkok, Thailand. 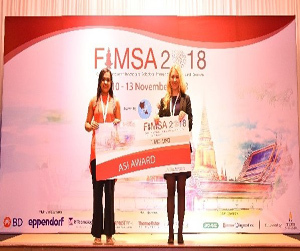 Dr. Laura Mackay (President of FIMSA) awarded Ms Suyasha with the ASI award of 1,000 USD at the closing ceremony. 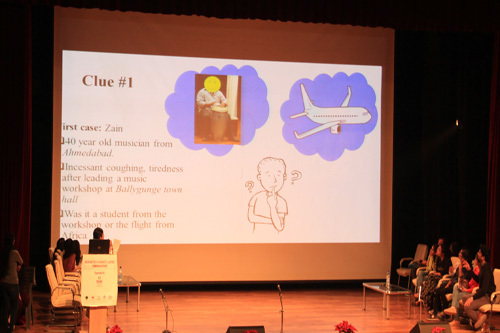 The lectures were followed by a Disease Detective game that saw participation by teams of PhD students from NII, NIPGR, ICGEB, RCB and THSTI. 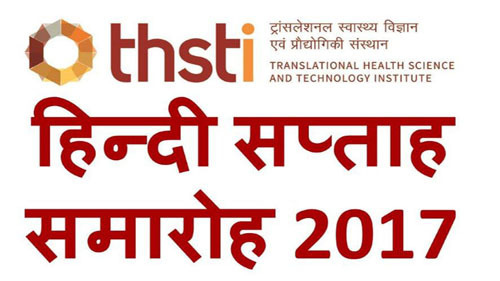 The International Vaccine Institute (IVI) and the Translational Health Science and Technology Institute (THSTI) of India will hold a joint symposium at IVI headquarters in Seoul, Korea on November 22. More than ten speakers, including four from THSTI and other participants from the Korea Health Industry Development Institute (KHIDI) and Indias Department of Biotechnology (DBT), will take part in the one-day symposium to share an overview of current research and development projects at THSTI and IVI, as well as to discuss common interests while exploring collaboration opportunities. 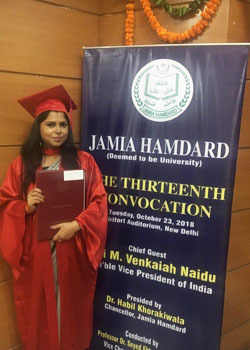 Our former PhD student Rinki Kumar (2011-12 batch) has been conferred the Doctoral Degree at the 13th convocation of Jamia Hamdard University held on 23rd October 2018 at Sirifort Auditorium. She has been awarded the degree for her thesis titled Host-pathogen interactions in dengue virus infection. Congratulations Dr. Rinki Kumar on achieving this feat ! 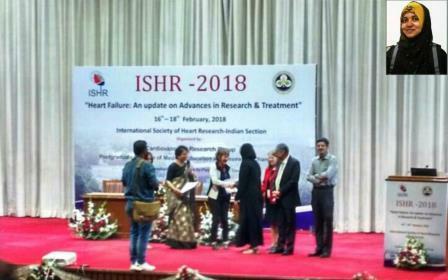 Ms. Hina Lateef has been awarded first prize in oral presentation for the research work entitled ‘Vitamin D deficiency in rats mimics high fat high fructose diet-induced cardiac dysfunction’ at the Cardiovascular Research Convergence 2018 (CRC 2018). 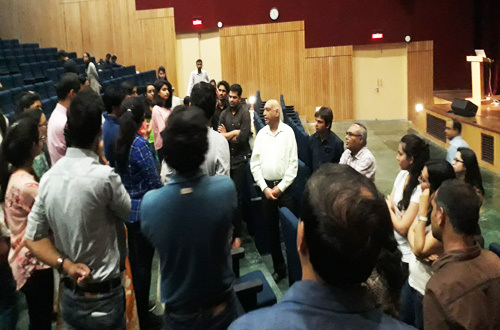 The meeting, jointly organised by All India Institute of Medical Sciences (AIIMS), New Delhi, and International Centre for Genetic Engineering and Biotechnology (ICGEB), New Delhi was held on 13th and 14th October 2018 at ICGEB and AIIMS, respectively. Dr. Amit Awasthi emerged as the new Secretary of the India Immunology Society after the elections for the Society Office Bearers on 11th October 2018. 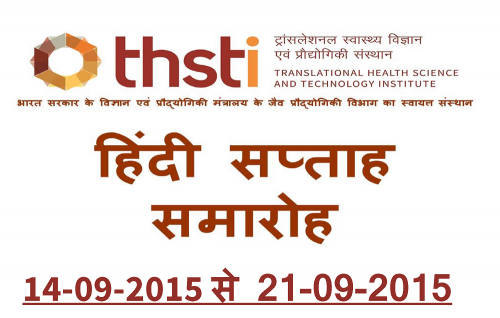 Dr. Awasthi is currently Associate Professor with THSTI. Congratulations to Dr. Awasthi and wishing him the best on taking up this new responsibility. 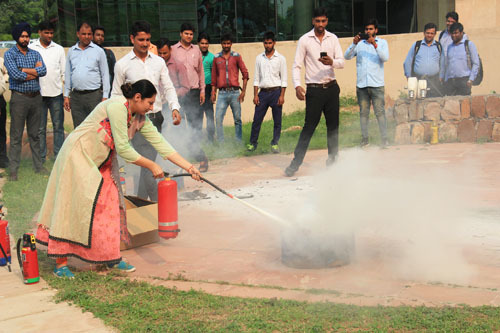 A training session in fire safety was organized with evacuation mock drills, mock drill for fire fighting along with presentation of Fire Fighting systems by Fire Officer of Haryana Fire Services and some agencies. 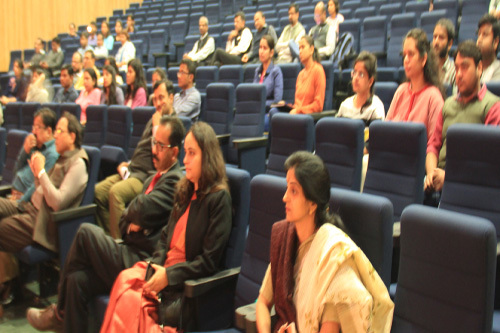 The session was attended by staff and students of THSTI. 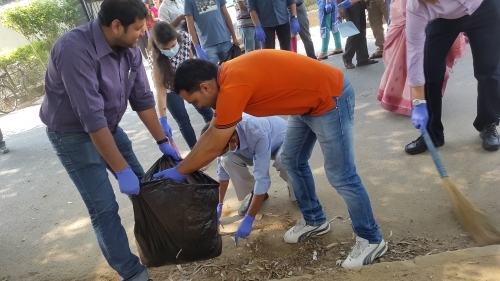 THSTI and RCB spearheaded the Swachhta hi Sewa campaign of NCR Biotech Science Cluster at Sainik Colony of Faridabad on 3rd October 2018. Students, scientists and other staff from both the institutes came together rallying in the locality and distributing pamphlets door-to-door to drive home the message - ‘Sanitation is everyones business.’ Street play artistes from Delhi joined the group from NCR-BSC to perform a Nukkad Natak as part of the awareness campaign. 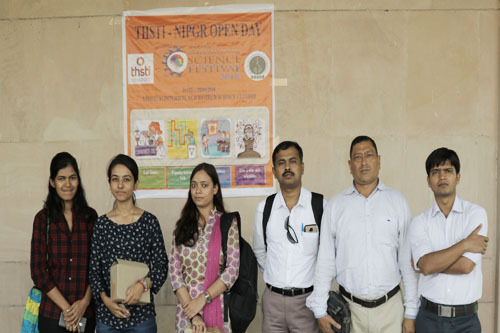 THSTI hosted the second Open Day with cluster partner NIPGR at THSTI on 28th September 2018 as a pre-event of the 4th India International Science Festival. 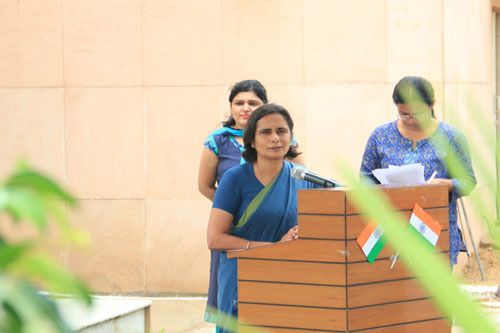 Executive Director, Prof. Gagandeep Kang declared the institute open in her address to more than 200 students and faculty from two schools and five colleges from across NCR in her welcome speech. 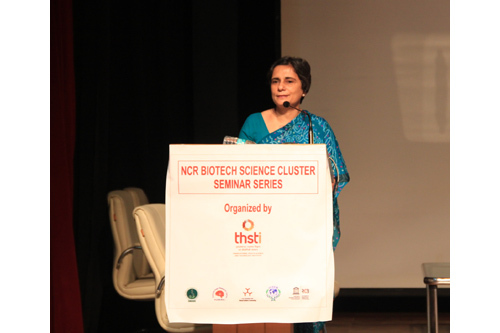 She introduced the young audience to THSTI underlining that the institutes mandate is to not only carry out basic research to avert public health challenges, but translate this knowledge to transform the diagnostic and therapeutic landscape in biomedical research. Noted columnist and author of Jal, Thal, Mal, Shri Sopan Joshi was the chief guest for the occasion. He also delivered the popular talk to mark the Open Day. 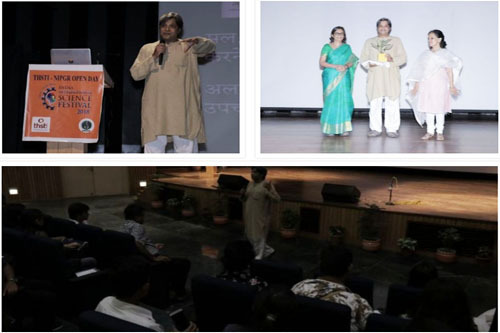 He presented very lucidly the relationship between water, earth and faeces and conveyed why understanding this connectedness is pertinent to improve sanitation in India. The days highlight was the tour around laboratories of THSTI, Small Animal Facility and Biorepository, intermittent with demonstrations, interactive sessions with scientists and poster presentations. 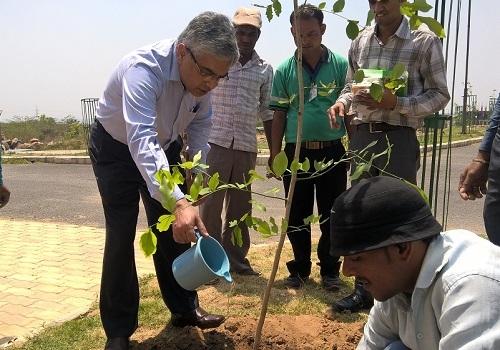 A plantation drive was inaugurated by Shri Amitabh Singh Dhillon (IPS), Commissioner of Police, Faridabad at the NCR - Biotech Science Cluster campus. 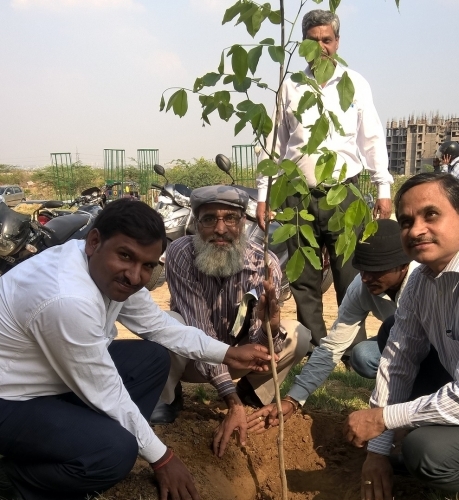 The plantation drive was initiated to maintain an ecological balance in the campus that occupies a part of an area sprawling over 200 acres. 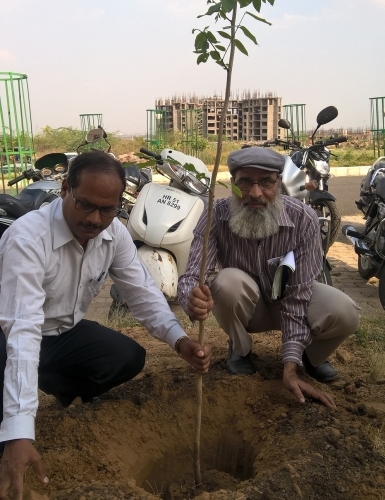 Prof. Gagandeep Kang, Executive Director, THSTI and Shri Dhillon addressed the crowd emphasizing the significance of the plantation and encouraged plantation for a sustainable co-existence of the campus with the environment. Drs. 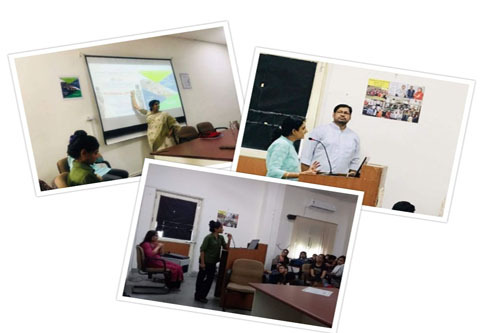 Susmita Chaudhuri, Tarun Kumar Sharma and Chandresh Sharma visited Maitreyi College of University of Delhi on 25th September 2018 for delivering lectures for this yeaRs Science Setu program. 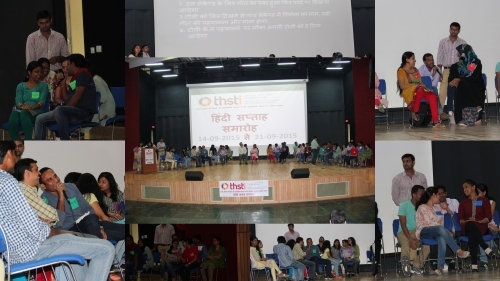 While Dr. Chaudhuri briefed the gathering of 180 students from both biological and physical sciences about THSTI, Drs. 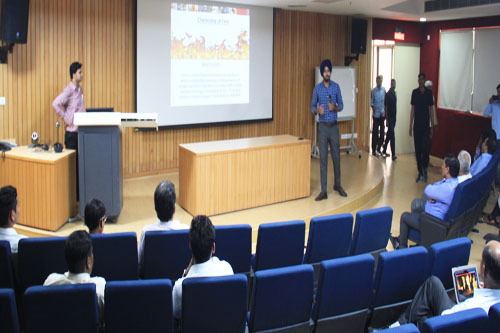 Tarun and Chandresh spoke about innovation in biotechnology products for healthcare. THSTI and Centre for Cellular and Molecular Platforms (C-CAMP) are jointly organizing a brainstorming session to initiate a discourse on issues of in vitro Diagnostic and Medical Devices. The meeting will be a platform for expert regulators and product innovators to discuss and define the most crucial and critical parameters for product development. The meeting will be held at THSTI on 24th September 2018. 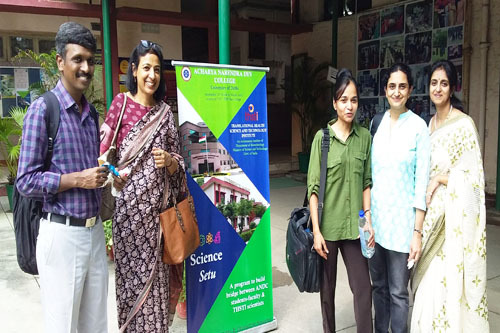 Five scientists of the Drug Discovery for metabolic diseases group visited Shaheed Rajguru College of Applied Sciences for Women (SRCASW) of University of Delhi at Vasundhara Enclave, East Delhi on 14th September 2018 for this years Science Setu program. 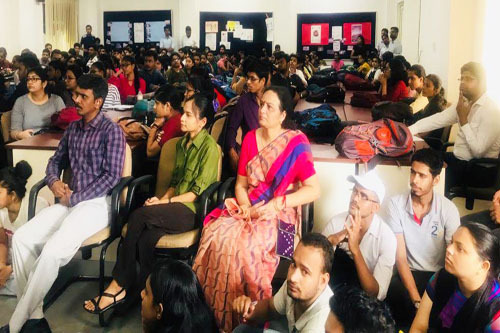 Two lectures were presented, (1) Drug Discovery in Academic Institutions in India by Dr. Sanjay Banerjee, and (2) Mathematics in Biology by Dr. Samrat Chatterjee, each followed by an interactive session. 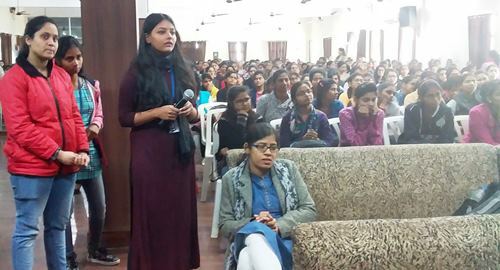 The lectures were followed by a Debate on experimenting on animals for biomedical research with Drs. Dinesh Mahajan, Shilpa Jamwal and Sameena Khan evaluating the participants. The group from THSTI also visited the laboratories at the college. 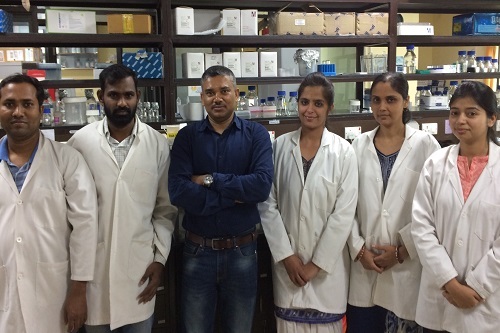 In collaboration with researchers at AIIMS, Dr. Tarun Sharma group has found that aptamer-based inhibitors bind to HupB protein found on the bacterial cell surface, significantly inhibiting its entry into host cells. “Compared with controls, the aptamer-treated bacteria showed reduced ability to enter the host cells. At 55%, the HupB-13T aptamer had greater ability to inhibit TB bacteria entry than the HupB-4T (42%) aptamer. So, targeting the HupB protein using aptamer-based inhibitors can effectively block TB infection and will be effective in both drug-sensitive and drug-resistant TB patients.” the newspaper quoted Dr. Tarun Kumar Sharma. 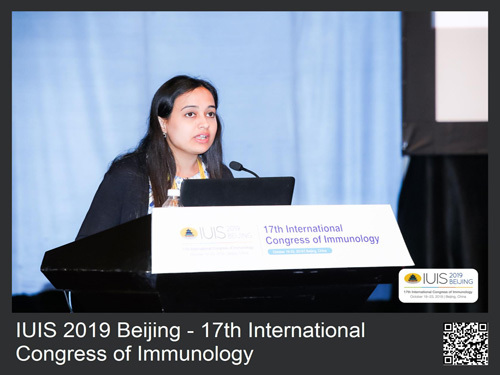 Suyasha Roy, PhD student of Dr Amit Awasthi (Immunobiology Laboratory, CHME) has received Travel Grant Award from International Union of Immunological Society (IUIS) for giving oral presentation on her PhD work at 5th European Congress of Immunology (ECI) held from 2nd-5th September, 2018 at Amsterdam, The Netherlands. Five scientists of the Maternal and Child Health group visited Acharya Narendra Dev College of University of Delhi at Govindpuri on 30th August 2018 for this years Science Setu program. Three lectures; (1) Biomarkers in Health and Disease, (2) Development origins of Health and Disease and (3) Skeletal muscle physiology in wellness and being, were presented each followed by an interactive session. 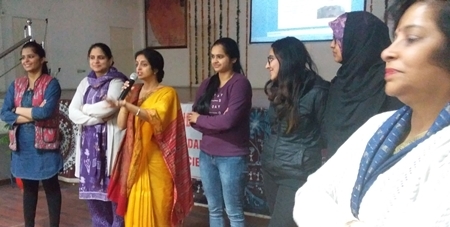 The lectures were followed by a Debate on "Pursuing higher education in science in India and not abroad", very well coordinated by the debating society of ANDC, TARK. During the visit the scientists also met members of the Th!nk Lab of ANDC which is a student-run initiative to encourage students to run small scientific projects in limited lab space. Antibiotic resistance is emerging as a major health challenge. Dr. Bhabatosh Das research team has found that friendly gut bacteria are a reservoir of drug-resistant genes which when transferred to disease-causing bacteria may make the disease untreatable. 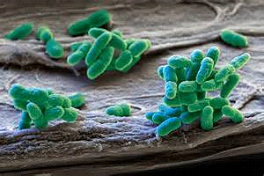 “It was surprising to see that friendly gut bacteria fostered resistance traits. This unexplored arm acts as a huge potential source of antibiotic resistance dissemination. We are currently working to resensitize these bacteria and make them antibiotic-sensitive,” said Dr. Das. The HIV Vaccine Translational Research (HVTR) Laboratory at THSTI, in collaboration with the International AIDS Vaccine Initiative (IAVI), a global non profit, is steering efforts to design a preventive vaccine against HIV. “Where prevention is concerned, this is one of the cleverest viruses we have ever seen. It can develop so rapidly that it can get past any immune defences. It is a virus that attacks the immune system, so it needs to figure out most quickly how to protect itself from the immune system and it does that by rapidly mutating. This is why this research is so important,” said Prof Gagandeep Kang, Executive Director, THSTI, while speaking to the Indian Express. The laboratory aims to develop a vaccine that would elicit an immune response capable of neutralising a broad spectrum of HIV immunogens. Dr Jayanta Bhattacharya, Principal Investigator at the laboratory explained that there are individuals who make antibodies that can kill a wide array of viruses circulating globally. Work is underway to identify such individuals to develop the antibodies. This is announcing Immunocon 2018, the 45th Annual Meeting of the Indian Immunology Society to be held from 1st – 3rd November 2018 at THSTI. Being the largest meeting in immunology, Immunocon 2018 will bring together immunologists from India and other countries at a common platform enabling researchers to present their work and network with fellow immunologists from all over the world. his year’s conference is themed “Immunotherapy and Advances in Immunology” encompassing all fields of immunology, ranging from innate and adaptive immunity to emerging diagnostics and therapeutics. Registrations are open now. More details on registration, speakers and the programme are available at http://immunocon2018.com/. Dr. Amit Awasthi, Chairman, Immunocon 2018 can also be contacted for other details. 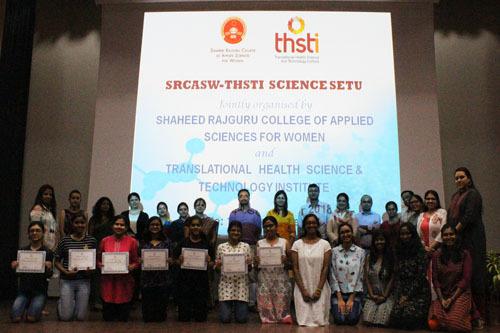 A 2-day workshop was organized by THSTI to impart a basic course in medical education for scientists from THSTI and RCB at THSTI on 6th and 7th August 2018. 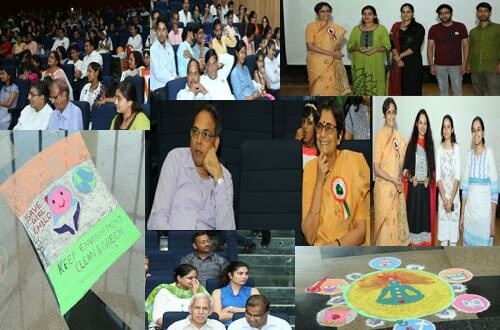 Faculty members from AIIMS visited the institute and were speakers and moderators for the workshop. Sessions conducted were on Group dynamics, Systems approach to educational process; Teaching-learning process and adult learning; Educational objectives – Taxonomy & Domains; Framing objectives, competences; Active learning - Principles; Small group teaching; Interactive large group teaching & lesson planning; Educational technology, e-learning and blended learning; Introduction to Microteaching; Skills teaching and simulation; Teaching and assessing communication skills; Quality improvement in medical education. 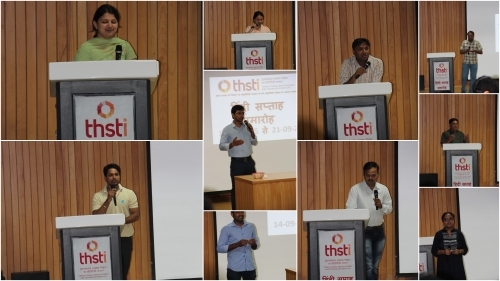 CDSA and THSTI organized this meeting in collaboration with the ICMR on 6th August 2018 at THSTI, Faridabad. It was attended by senior clinical researchers, trialists, members of ethics committees, independent ethics experts from different institutions in the country and a representative from CDSCO. A common review process for ethical approval of multicentre studies and a pilot undertaken using the process was presented. The discussions focused on how the proposed common review process would apply to multicentre clinical trials. There was much debate on roles and responsibilities of the ethics committee chosen to undertake the common review (designated ethics committee) and of the ethics committees of the participating sites. The general consensus was in support of a common review process as it was felt that it would enhance the quality of the ethical review. The final recommendations will be added as an appendix to the recently released ICMR National Ethical guidelines for Biomedical and Health research involving human participants released in 2017. An aptamer-based diagnostic test for TB meningitis has been patented by AIIMS and THSTI and licensed to AptaBharat Innovation Pvt Limited, a THSTI start-up founded by Dr. Tarun K. Sharma. 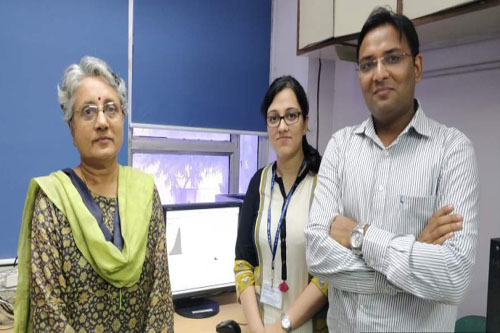 A diagnostic test for TB meningitis (the most severe form of TB) with nearly 100% sensitivity and about 91% specificity has been developed by a multi-institutional team led by Prof. Jaya Sivaswami Tyagi (Department of Biotechnology at AIIMS) and Dr. Tarun Kumar Sharma (THSTI) in collaboration with Dr. RML Hospital, IIT-Indore and UTU, Uttarakhand. A rapid, point-of-care diagnostic test for TB meningitis that uses the DNA aptamer has already been adapted to a sensor format and is being evaluated on clinical samples. "While antibodies have to be generated in animals and so will not be of uniform quality, aptamers can be produced in the lab", the newspaper quoted Dr. Tarun on the advantage of using aptamers. 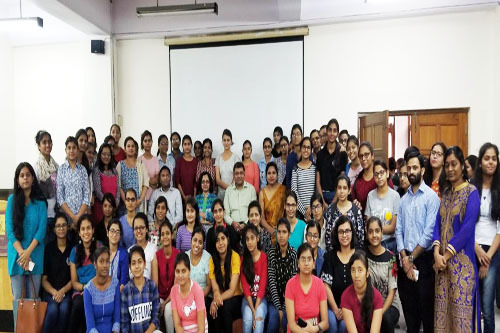 Students in the First Year of BSc (Nutrition and Dietetics) of the Faculty of Applied Sciences, Manav Rachna International University visited THSTI on 25th July 2018 (Wednesday). They received a brief introduction about the institute’s goal and research programmes by Dr. T. Ramamurthy, National Chair, THSTI. 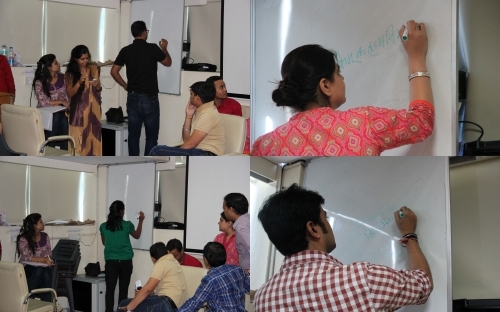 What followed was a short interactive session with other members of the Science Setu committee. 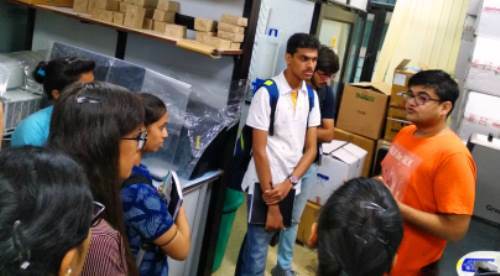 The students got to interact with PhD students and technical staff as they were taken around to visit laboratories and facilities in the institute. 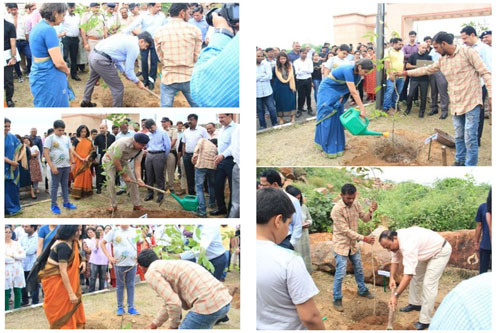 As the institute completed its 9th year, the THSTI fraternity was joined by the Secretary, DBT, Dr. Renu Swaroop, Prof. Anil K. Gupta, Founder of Honey Bee Network and a renowned advocate of grassroot innovations along with dignitaries from DBT and other institutes to commemorate the Foundation Day. 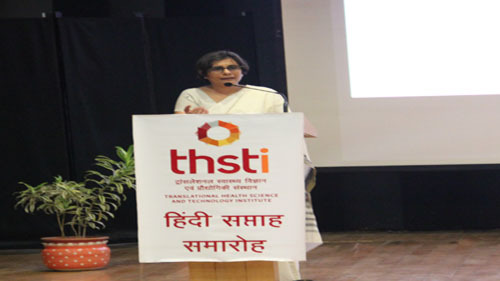 Prof. Gagandeep Kang, the current Executive Director ushered in the celebrations by briefing the audience about the institute’s strengths, the proposed reorganization of THSTI into its original cabinet-approved structure, achievements in the past one year and where we see our self at different time points over the next 10 years while also emphasizing on nurturing partnerships within and beyond the cluster to accomplish our goals. 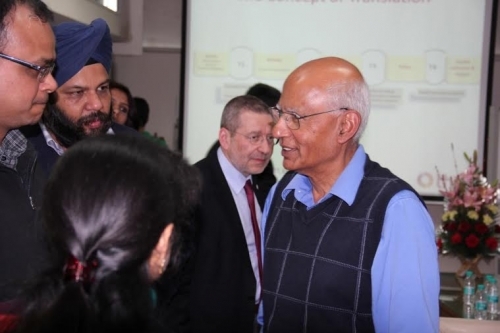 The Foundation Day Address by Prof. Gupta educated the audience about ‘a new grammar for translational research’ to let context guide the content of our research, significance of collaborations and involvement of end-users of research in its design. Secretary, DBT in her Presidential Address congratulated the institute on its efforts of knowledge generation through basic research and moving towards product development, high-quality students output, remarkable national and international partnerships and emphasized on induction of entrepreneurial ventures and importance of collaborations to take the institute forward. She endorsed THSTI’s efforts in putting in place a governance mechanism and modifying its policy to solidify and continue academia-industry collaborations. A Panel chaired by Prof. Gupta discoursed on translational research: who should do it, what can be defined translational and what equips an institute to carry out translational research. 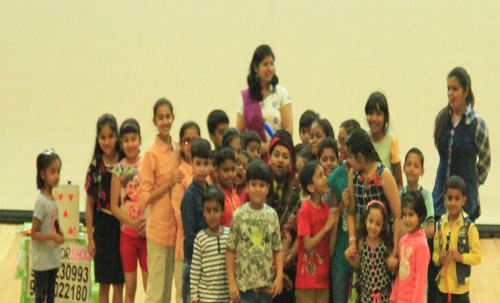 The first half was concluded with a prize distribution ceremony for competitions organized for students and staff. 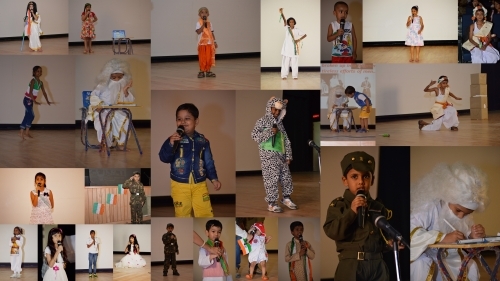 The second half of the day was dedicated to cultural events which saw students and staff showing equal enthusiasm in participation. Mr. Bugga Paramesha, PhD student working with Dr. Sanjay K Banerjee, has bagged the best poster presentation award for the research work entitled ‘Modulation of Mitochondrial Deacetylase, SIRT3 Altered Mitochondrial Biogenesis and function in Diabetic rat heart and H9c2 cells’ in the workshop and symposium on “Translational Research in Biomedical and Agricultural Sciences”, Jointly organized by Indian Society of Translational Research (ISTR) &Department of Biochemistry, AIIMS, New Delhi and was held on 6th -7th July 2018. 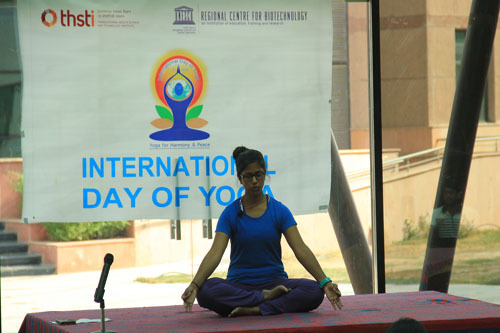 THSTI and RCB observed the 4th International Yoga Day on June 21, 2018 at the NCR Biotech Science Cluster, Faridabad. 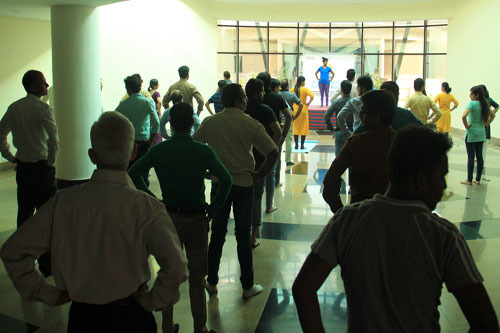 The event received enthusiastic participation of people from the two institutes who practiced various asanas and meditation during the hour-long session. 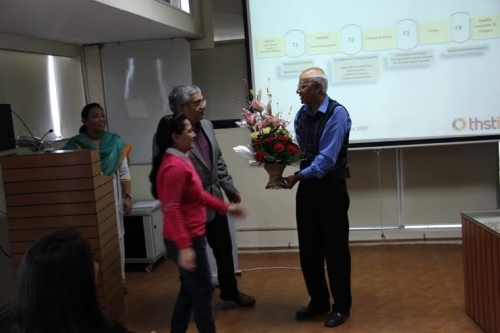 The session was steered by Niti Singh, a student at THSTI, who was presented a token of appreciation by the Executive Director, THSTI for her effort. 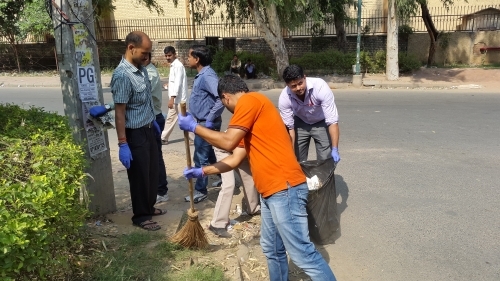 THSTI is observing the Swachhata Pakhwada (स्वच्छता पखवाड़ा) from 07th to 11th May 2018. 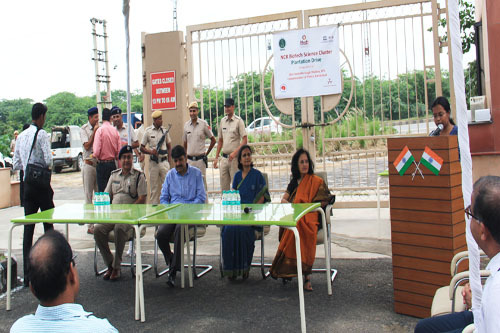 The event began with a Swachhta pledge lead by the Head of Administration, Mr. M. V. Santo. 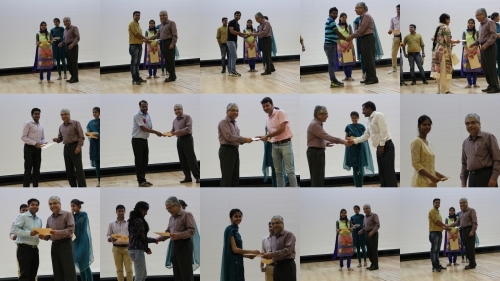 This was followed by an extempore competition which saw participation across students, scientists and technical staff eloquently expressing their views on the significance and pertinence of cleanliness in general and at scientific organizations in particular. 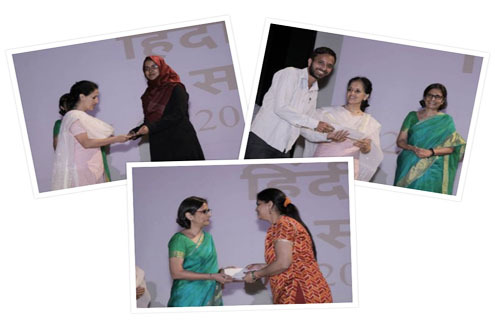 The winners Ms. Minakshi Kar, Mr. Sumit Kumar Sharma and Mr. Prashant Bhujbal were awarded cash prizes. Dr. Madhu Dikshit, National Chair (DDRC), who was also on the jury for the extempore, spoke about owning up the responsibility for cleanliness rather than only expressing one’s entitlement to it. The meeting was concluded after a vote of thanks and tea. Suyasha Roy, PhD student of Dr Amit Awasthi (Immunobiology Laboratory, CHME) has been selected for Newton Bhabha PhD Placement Programme 2017-18 for undergoing short-term research internship at Kennedy Institute of Rheumatology, University of Oxford, United Kingdom. The programme is jointly funded by the Department of Biotechnology (DBT), Government of India and British Council, United Kingdom. Dr. Guruprasad Medigeshi, a faculty member of THSTI along with co-organizers Dr. Nagendra Hegde of National Institute of Animal Biotechnology, Hyderabad and Dr. Katja Fink of Singapore Immunology Network (SIgN) organized a symposium titled RNA viruses: Immunology, pathogenesis and translational opportunities at Vivanta by Taj, Faridabad (Haryana) on 28th and 29th March 2018 and at National Biotech Science Cluster on 30th March 2018. 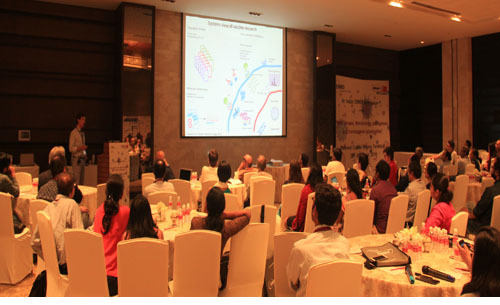 EMBO and Wellcome Trust-DBT India Alliance provided funding support for the meeting. 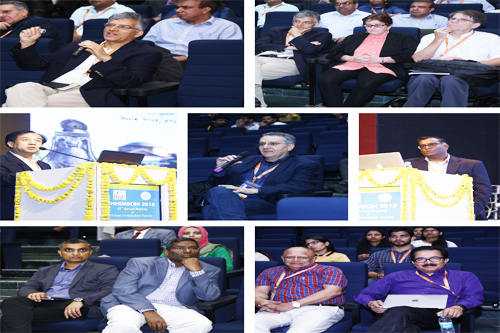 The symposium was intended to bring together RNA virus experts of national and international repute to assess and provide a roadmap for RNA virus research in India. Five sessions were organized with talks overarching epidemiology, disease burden and risk factors associated with RNA viruses, pathogenesis and evolution of RNA virus infections, viral and immunological determinants, novel strategies for vaccine development targeting new markets, clinical trials and models to test therapies and vaccines. 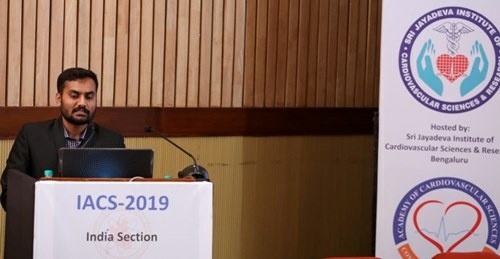 Prof. Maharaj Kishan Bhan, National Science Professor, IIT Delhi delivered the keynote lecture elaborating on the importance of RNA viruses and the gaps in knowledge and challenges for RNA virus research in India. 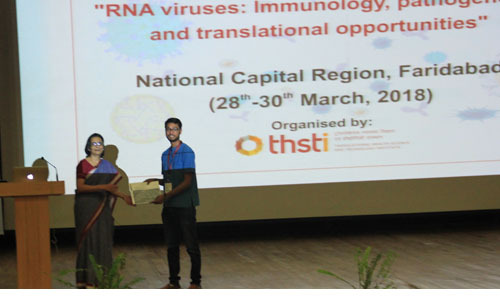 Poster sessions were conducted on Day 1 and 2 of the symposium wherein the students, post-docs and young researchers got the opportunity to interact with leaders in the RNA virus research area.s and the best poster was rewarded during the closing session at THSTI. 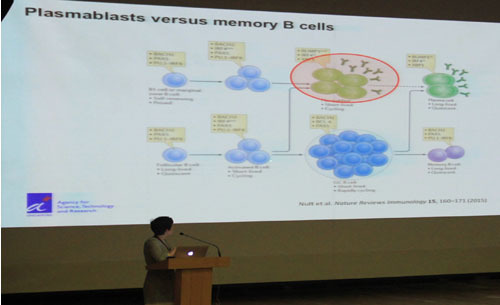 EMBO Young Investigator lecture was delivered by Dr. Nolwenn Jouvenet from Institut Pasteur, Paris, France. 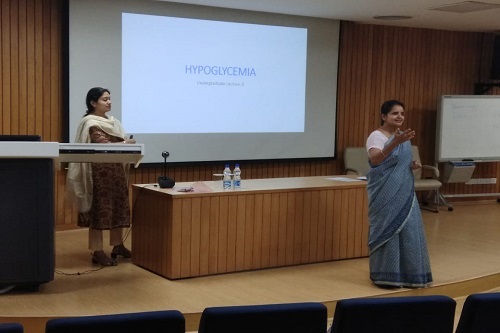 The EMBO “Women in Science” lecture was delivered by Prof. Sandhya S. Visweswariah from the Indian Institute of Science, Bengaluru. The delegates were also given a tour of the NCR Biotech Science Cluster. The session chairs summarized the lectures in the form of a take home message for all the participants in their “Crystal Gazing” session at the end. 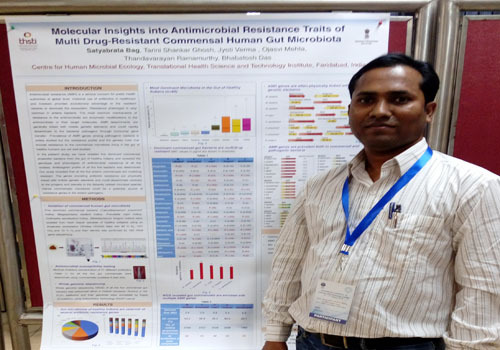 Dr. Satyabrata Bag working as Technical Officer - II with Dr. Bhabatosh Das of the Center for Human Microbial Ecology received the Best Poster presentation award at the International Conference on Antimicrobial Resistance held on 16th and 17th February 2018. His winning poster was titled Molecular Insights into Antimicrobial Resistance traits of Multi Drug-Resistant Commensal Human Gut Microbiota. The Conference was jointly organized by National Institute of Pharmaceutical Education and Research (NIPER) and ICMR-National Institute of Cholera and Enteric Diseases both based in Kolkata. THSTI was one of the organizers of the 5th global forum on TB vaccines held from 20-23 February 2018 at New Delhi, India. Selected delegates who attended the forum visited THSTI as a part of the site visit offered by the forum. During the visit, the participants got an opportunity to tour the research facilities and interact with the scientists at the institute. 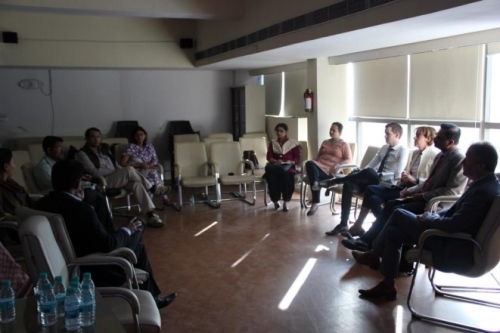 Dr. Karlee Silver, Vice President (Programs) of Grand Challenges Canada accompanied by her team of researchers visited the Gurugram Civil Hospital (GCH) and THSTI to learn about the ongoing studies on preterm birth, the associated stress outcomes on pregnancy & fetal growth and creation of a biorepository being pursued by the host teams. The meeting was also used as a platform to exchange views on similar programs across the globe. GCH and THSTI are the joint recipients of grants under the Grand Challenges India (GCI) Program awarded to carry out maternal and child health research. The collaboration is also funded by the Department of Biotechnology (Government of India), Biotechnology Industry Research Associate Council (BIRAC) and the Bill and Melinda Gates Foundation – Wellcome Trust. 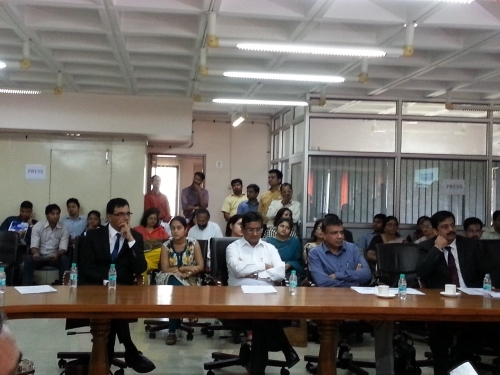 Dr. Silver was accompanied by Dr. Shirshendu Mukherjee, Dr. Arpita Gupta and Dr. Richa Vashishta from BIRAC. Representatives from both GCH and THSTI were present for the meeting to brief the visitors about their roles and responsibilities in GCI. GCH officials who attended were Dr. Pradeep Sharma, Dr. Brahmdeep Sindhu, Dr. Sunita Sharma, Dr. Umesh Mehta and Dr. Manoj Sharma. 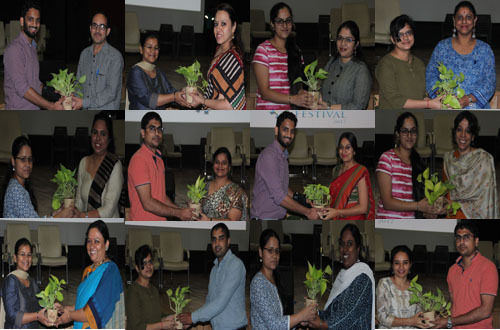 THSTI was represented by Dr. Shinjini Bhatnagar, Dr. Nitya Wadhwa, Dr. Uma Chandra Mouli Natchu, Dr. Shailaja Sopory and Dr. Pallavi Kshetrapal with their clinical and project management teams. Ms. Hina Lateef Nizami, PhD student with Dr. Sanjay K. Banerjee (DDRC), has bagged the best poster presentation award for the research work entitled ‘Paricalcitol, a VDR agonist, attenuates diabetes-induced heart failure: A new therapeutic implication’ in the 15th Annual Meeting of International Society of Heart Research (ISHR)-Indian section. 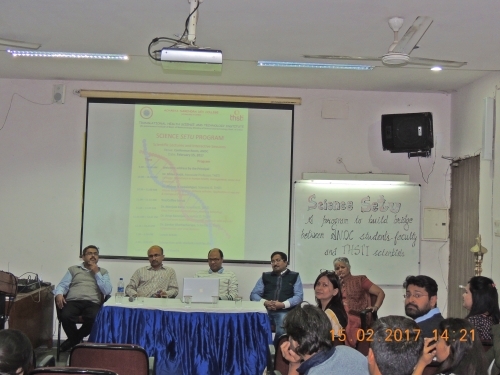 The meeting on the theme ‘Heart Failure: Past,Present and Future’ was held from 16th to 18th February 2018 at the Postgraduate Institute of Medical Education and Research (PGIMER), Chandigarh. Ms. Hina has received the award from Dr. Elizabeth Murphy, President of ISHR (world). THSTI has signed a MoU with Indian Council of Medical Research (ICMR) on 2nd February 2018 at ICMR for building the basic, clinical, translational and implementation research ecosystem in India. The Executive Director, THSTI, Dr. Gagandeep Kang and the Additional DG, ICMR, Dr. Sanjay Mehendale signed the MoU aimed at establishing joint working groups towards upscaling research outcomes for the benefit of the society. On the occasion, the Director ICMR-NIMS, New Delhi, divisional heads of the ICMR headquarters and senior scientists from THSTI were also present. targets against cancer using genome-scale metabolic model”. Human infection and challenge studies have been carried out in several countries over several decades, and have led to significant advances in medicine, especially in the development of vaccines. They are especially useful in understanding immune responses to infection and thus can provide unique insights into disease pathology in a relatively short period of time. A meeting was organized by the THSTI in collaboration with the Department of Biotechnology (DBT) and the Indian Council of Medical Research (ICMR) to discuss the feasibility and the ethical issues associated with Controlled Human Infection Models (CHIM) studies. The meeting was held on the 7th and 8th of January 2018 at the Tata Institute of Social Sciences (TISS) in Mumbai. The meeting was attended by a diverse group of participants including lawyers, researchers, social scientists, ethicists, vaccine manufacturers and media personnel. Though human infection challenge studies are being carried out in other parts of the world, for diseases such as typhoid, malaria, and dengue which are common in India, there are no such studies being done in our country. There is also very little bioethical literature available on this subject, and there have been limited discussions on the subject. 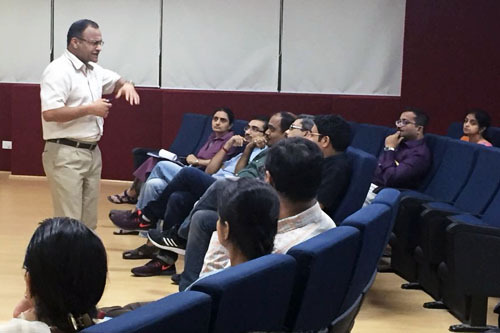 THSTI is working with ICMR to develop guidelines for such studies, and this meeting was the first in a series that we anticipate will continue for several months. Dr. Bhabatosh Das has been awarded the Bill and Melinda Gates Foundation travel grant to present his research findings at the 52nd US-Japan Joint Panel Conference on Cholera and Other Bacterial Enteric Infections, Hat Yai Thailand from 20-24 February 2018. 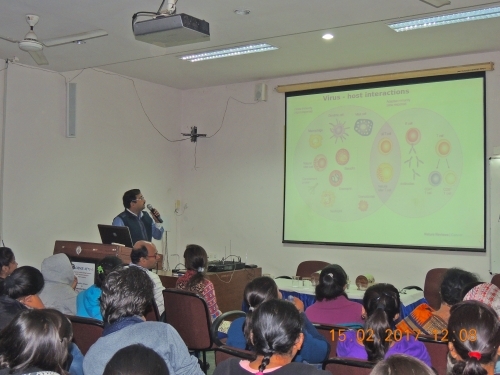 THSTI organized a Lecture and Workshop series on 13-14 December 2017 at THSTI and the National Institute of Immunology, Delhi. Day 1 was themed around big data science and its management. Prof. Alexander Hoffmann from UCLA was the distinguished speaker of the day. 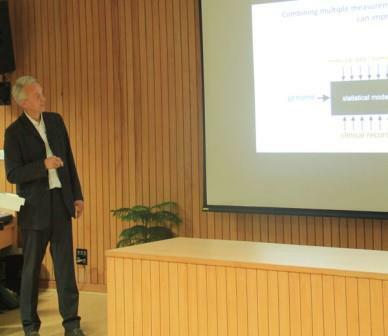 Prof. Hoffmann further provided a systems biologists perspective of immune compartments. Day 2 was focussed upon education outreach efforts using research as a tool. Prof. Tracy Johnson shared her experiences about leading education and outreach activities at UCLA. Later in the day, she also talked about mechanisms underlying transcriptional regulation by splicing machinery. 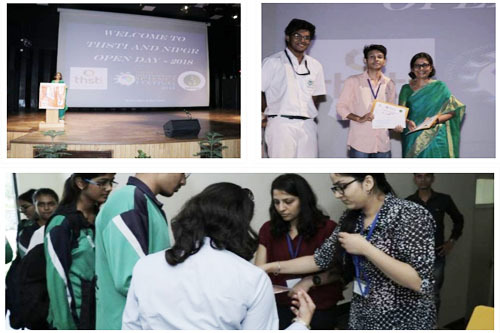 The event observed enthusiastic participation of students and scientists from the NCR Biotech Science Cluster. THSTI observed Vigilance Awareness Week from 30th October - 04th November, 2017. 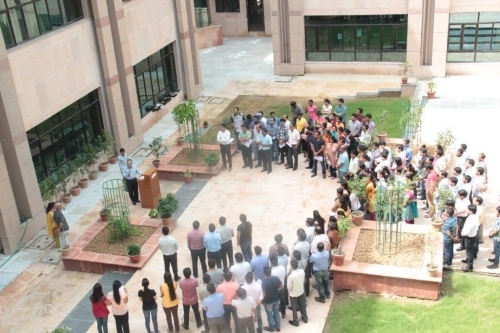 The week commenced with the administration of integrity pledge by Dr. Guruprasad Medigeshi, Chief Vigilance Officer. 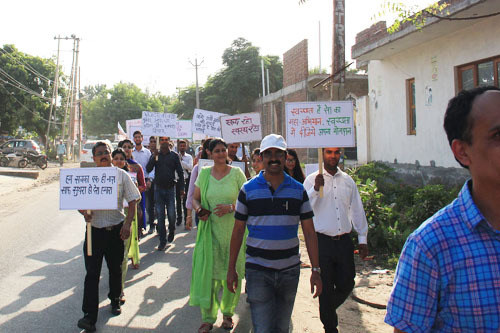 Members of THSTI community pledged in large numbers to fight against corruption and to promote integrity, transparency, and accountability in public life. Dr. Niraj Kumar, Scientist at the Center for Bio-Design and Diagnostics (CBD), THSTI, and Co-founder of Tritek Innovation Pvt. Ltd, has bagged the second prize under Faculty-lead Start-up Category at National Start-up Summit 2017 organized by AICTE during India International Science Festival 2017, Oct 14-15 at Chennai. IISF 2017 was organized by the Government of India and Vijnana Bharati (VIBHA) along with other ministries/departments including Ministry of Earth Sciences, DST, DBT, CSIR, ISRO, DAE, DRDO, ICAR, and MNRE. The winning team comprised of Dr. Niraj Kumar, Dr. Shubhangini (Lead Scientist, Tritek Innovation Pvt. Ltd.), Dr. Susmita Chaudhuri (Scientist, CBD and Co-founder, Tritek Innovation Pvt. 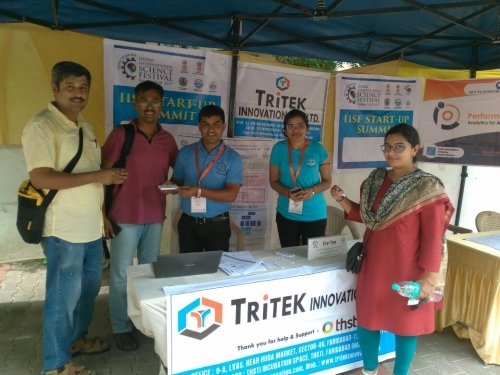 Ltd) and Dr. Priyanka Maurya (Director-Operations, Tritek Innovation Pvt. Ltd.). Dr. Shinjini Bhatnagar, Dean, Clinical Research has been elected as a Fellow of the Indian National Science Academy with effect from January 1, 2018. 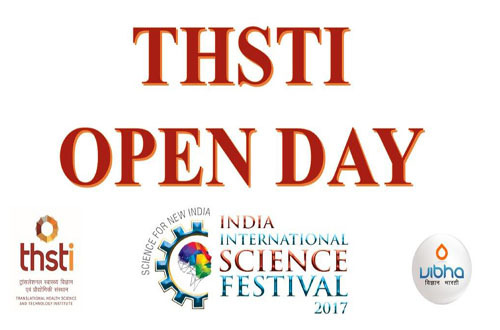 THSTI organized an Open Day on September 22, 2017 (Friday), as a pre-event of the 3rd India International Science Festival, jointly organized by the Ministry of Science and Technology together with Ministry of Earth Sciences, Government of India and Vijnana Bharati (VIBHA). Several events were put together for the entire day. 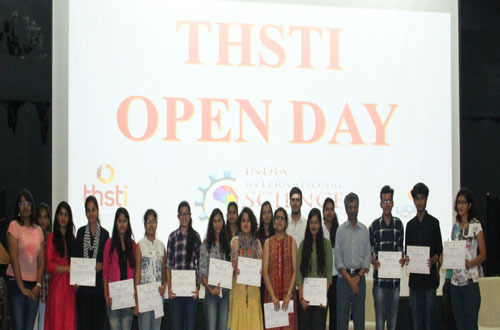 More than 100 students and faculty members from eight colleges of Delhi NCR visited THSTI. Dr. S.V. 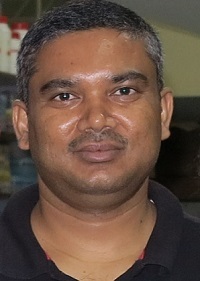 Eswaran, Visiting Scientist (Hony. 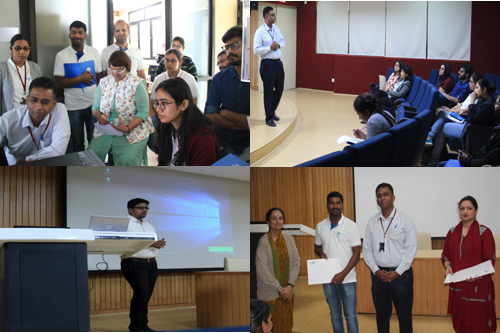 ), Regional Centre for Biotechnology delivered a popular talk titled “Cataractogenesis & Theranostics” and steered the college students into having an enthusiastic day at THSTI. 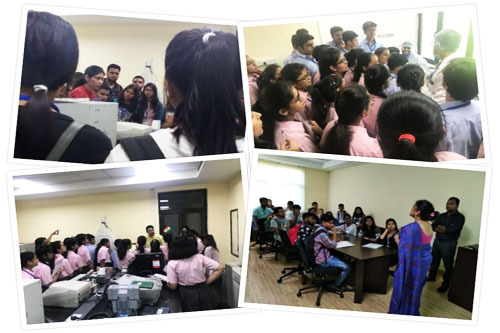 The students visited various laboratories and interacted with the scientists, faculty and students of THSTI in the post-lunch session. Dr. Bhabhatosh Das has been awarded the Japan Society for the Promotion of Science (JSPS) Invitational Fellowship Award (2017) for Research in Osaka University, Japan. His research would focus on the role of intestinal microorganisms in host commensalism. With support from the Wellcome Trust/ DBT India Alliance, Dr. Amit Awasthi along with Dr. Shantanu Chowdhury from IGIB, New Delhi and Dr. Amit Dutt, ACTERC, Navi Mumbai, co-organized an intense day-long brainstorming meeting on liquid biopsy in Precision Medicine on 26th August 2017. Participants, restricted by invitation only, included clinicians from TMH (Mumbai), AIIMS (New Delhi), TMC (Kolkata), CMC (Vellore) and Artemis Hospital (Gurugram), industrial experts from Strand Life Sciences, Medgenome, SRL Diagnostics, and basic scientists from PHFI (New Delhi), THSTI (Faridabad), IGIB (New Delhi), IITD (New Delhi), IITK (Kanpur), IICB (Kolkata), NIBMG (Kalyani) and Glocal University (Saharanpur) along with representation from NCI/ NIH, USA. The organisers and participants are in process of drafting a white paper as a multi-institutional effort to describe the current status of liquid biopsy in India and propose ways for its wider and uniform adoptability in clinics. 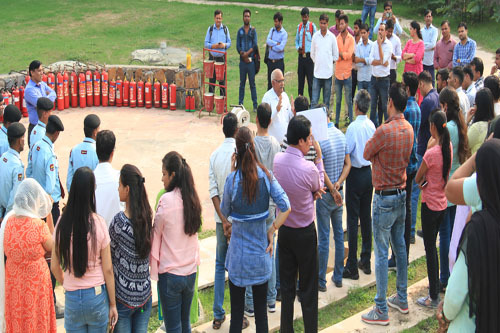 THSTI, along with St. John’s Ambulance Association, Delhi organized a two day training programme on first aid for the benefit of its employees. The programme was organized on 24 th -25 th August 2017 and a total of 33 people participated in the training. Dr. R.K. Sharma, Sr. Lecturer & Examiner, St. John’s Ambulance Association, shed light on the fundamentals of first aid, dressings and bandages, and how to deal with fractures, wounds, burns, animal bites, asphyxia, shock, cardio- pulmonary resuscitation, stroke, to name a few. Along with the learning on the various first aid measures, the participants went home with a guidebook to first aid and a certificate in hand. 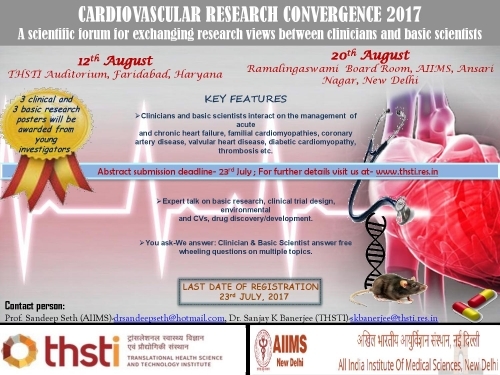 THSTI organized a meeting aimed at exchanging research views between clinicians and basic scientists on translational research in cardiovascular medicine on 12th August 2017 at the Translational Health Science and Technology Institute (THSTI), Faridabad and on 12th August 2017 at the All India Institute of Medical Sciences, New Delhi, respectively. This meeting was a mid-term activity of International Society of Heart Research (ISHR), Indian Section. 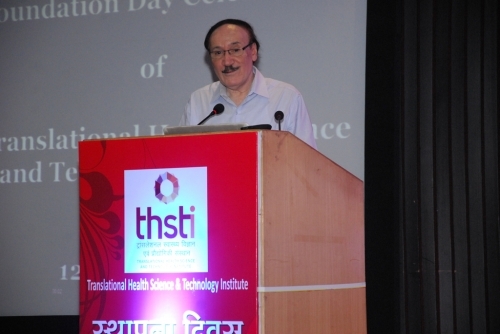 The meeting at THSTI primarily focused on (i) understanding cardiovascular complication in diabetes and identify newer therapeutic strategies to reduce disease complication, (ii) understanding heart failure in clinic and finding its treatment, and (iii) role of gut microbiome on cardiovascular and metabolic diseases. Distinguished cardiologists and scientists like Prof. K K Talwar, Prof. N K Ganguly, Prof. S K Maulik, Prof. Sandeep Seth, Prof. P S Reddy, Prof. S S Kothari, Prof. Uday Ghoshal, Prof. Pralay Chakravarty, Dr. G R Chandak, Dr. Rishi Gupta and Dr. S S Bansal were present and discussed their views. 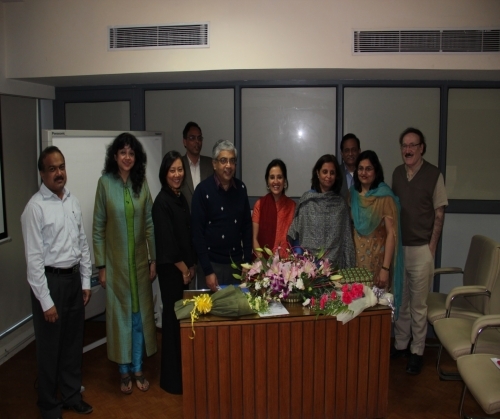 A group of Project Investigators (PI) and experts in science, policy, academia, and social entrepreneurs visited Civil Hospital Gurugram (CHG) on 25th March 2017. The CGH is the primary clinical research site of three crucial grants funded to the Pediatric Biology Centre of THSTI under the All Children Thriving (ACT) initiative. The visit was planned to observe the research activities at the site and to exchange views on similar programs across the world. The Indian team was led by Dr Shirshendu Mukherjee (Mission Director, Grand challenges India) along with Project Investigators from THSTI Dr. Shinjini Bhatnagar, Dr. Uma Chandra Mouli Natchu and Dr Pallavi Kshetrapal. The international delegates were Dr. Jake Glanville (Chief scientific officer and co-founder of Distributed Bio, USA) Dr. Claude Primez (from Instituto Oswaldo Cruz and representing Grand Challenges Brazil), Dr. Zoleka Ngcete (Project Co-ordinator for South African Malarial Initiative), Dr. Evelyn Gitau (Program manager, Grand Challenges, Africa), Ms. Farhana Sultana (Research investigator at ICDDR, Bangladesh and 2014 Grand challenges awardee), Mr. Bidhan Sarkar (Centre for reproductive health, ICDDR, Bangladesh) and Dr. Saijuddin Sheikh (Associate Faculty, John Hopkins Bloomsberg school of public health). 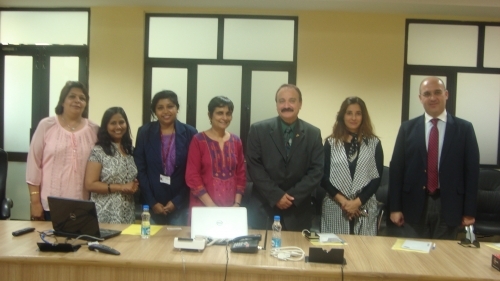 The group interacted with CHG officials Dr. Kanta Goel (Principal Medical Officer) and Senior Medical Officers Dr. Brahmdeep Sindhu, Dr. Sunita Sharma and Dr Umesh Mehta to understand their support and role in the studies funded under GCI initiative. 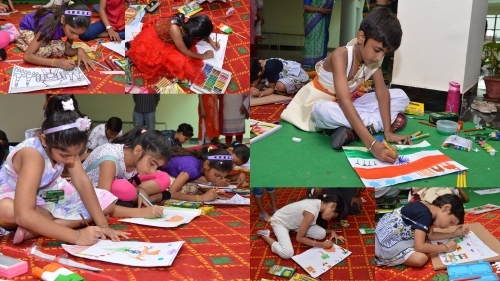 The All Children Thriving is an initiative under Grand Challenges India programme, jointly supported by the Department of Biotechnology, Biotechnology Industry Research Assistance Council and Bill and Melinda Gates Foundation in partnership with USAID. Dr. Amit Awasthi receives the 2017 Early Career Faculty Travel Grant from the American Association of Immunologists (AAI). The travel grant supports travel to the annual AAI event. Dr. Amit Awasthi, Associate Professort at CHME has been elected to the executive committee of the Indian Immunology Society. He has been awarded the GP Talwar Mid Career Scientist Award for the year 2016 at the 43rd Immunocon held in Vishakapatnam . The award is given for original immunological work done in India for members of the Indian Immunology Society. The award carries a certificate of honor, medal and cash prize. Egyptian Delegates, MG Dr Mamdouh El bahnasawy, Col. Sherif Fekry, Ms. S Anderson visited THSTI on 4th March, 2017. 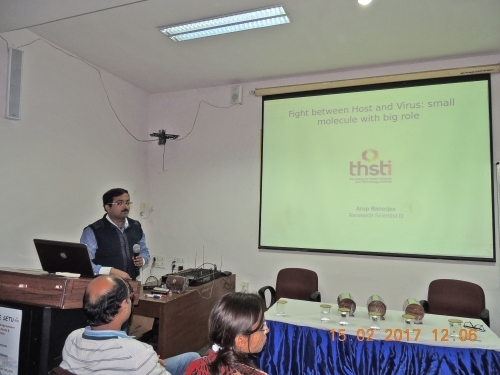 The 5th Molecular Virology meeting was held at THSTI on 11th and 12th February 2017. 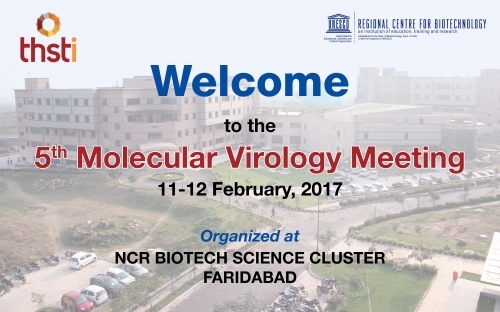 The meeting brought together leading researchers working on different aspects of Virology. The meeting covered both basic and applied research and provided a platform to discuss latest developments in areas of host-virus interactions, immune responses and vaccine development, molecular biology, evolution and epidemiology of viruses and emerging therapeutics and diagnostics. 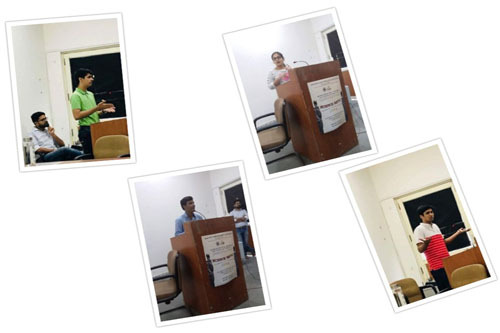 The meeting included poster presentation by the students from various institutes. 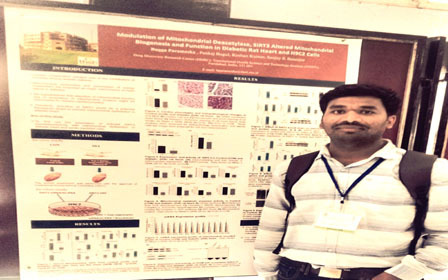 Mr. Parmeshwar Katare,PhD student with Dr. Sanjay Kumar Banerjee, DDRC has bagged the best poster presentation award for the research work entitled “Sulfur Metabolites from Garlic Activate SIRT-3 to Prevent Mitochondrial Dysfunction in Diabetic Heart” in the 14th annual meeting of International Society of Heart Research, (ISHR) Indian section held from 27th to 29th January 2017 at the CSIR-Institute of Genomics and Integrative Biology, New Delhi, India. THSTI faculty from the virology group of VIDRC visited Acharya Narendra Dev College on 14th and 15th Feb 2017 as part of the science SETU program.The program had scientific lectures and interactive sessions. 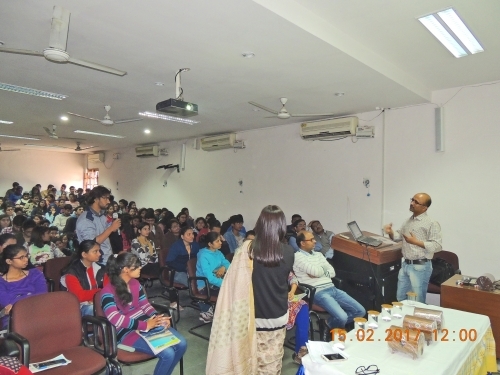 As part of implementation of the Science Setu program, the faculty and scientists of THSTI from the Drug Discovery Research Centre (DDRC) and Vaccine and Infectious Disease Research Centre (VIDRC) visited Maitreyi College, New Delhi on 18th October 2016 and on 24th and 25th January 2017 for interaction with students and teachers. Presentations and discussions covered topics from systems biology, conceptual understanding of the language of biology, vaccines and drugs for tuberculosis, biology of viruses, host-virus interactions and current and future prospects of virology. Dr Sagarika Haldar received the Global Health Travel Award funded by the Bill & Melinda Gates Foundation to attend and present awarded research work as a poster entitled Utility of Mycobacterium tuberculosis antigens derived from serum and serum derived exosomes for the diagnosis of Extrapulmonary Tuberculosis at the Keystone Symposium: A5, New Developments in Our Basic Understanding of Tuberculosis held at the Fairmont Hotel Vancouver in Vancouver, British Columbia, Canada on January 14 – 18, 2017. THSTI and AIIMS have recently filed an Indian provisional patent application on novel aptamers against mycobacterial nucleoid-associated protein HupB and uses thereof. 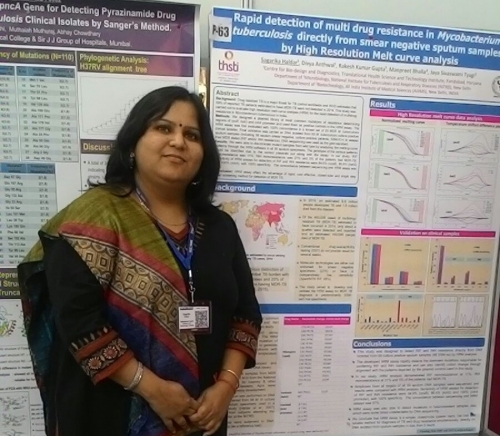 A team of researchers from THSTI and AIIMS led by Prof. Jaya S. Tyagi and including Dr. Hanumanthappa Krishna Prasad, Dr. Tarun Kumar Sharma, and Priya Kalra, is working on establishing use of these novel HupB aptamers in rapid and accurate diagnosis of TB in humans and as therapeutic agent in anti-TB pharmaceutical compositions. The Department of Biotechnology, Government of India entrusted THSTI for organizing 2nd Board Meeting of Global Coalition for Epidemic Preparedness Innovations (CEPI) in India on December 15-16, 2016 in Hotel Taj Palace, New Delhi. The CEPI focuses on the development of new vaccines for known and unknown pathogens and being a founder of the coalition, DBT was hosting the second meeting of the CEPI. THSTI organized a Scientific Meeting on the “Role of the India Vaccine Industry in Global Public Health” on December 15, 2016 followed by the Second Meeting of the CEPI on December 16, 2016. Honble Cabinet Minister for Science & Technology and Earth Sciences, Government of India, Dr. Harsh Vardhan was Chief Guest in the event. The event was attended by Dr. Vijaya Raghavan, Secretary, DBT and Dr. Jeremy Farrar, Director, Wellcome Trust along with more than 30 delegates from India and abroad. Speakers at International Seminar on Technology Transfer as a Tool to optimize IP and Innovation organized by National Development and Research Centre (NDRC) on 9th January, 2017 visited THSTI on 10th January, 2017 to explore collaboration opportunities. THSTI is one of the locations for the Indo-Finnish Diagnostic Research Centre (IFDRC) which is collaboration between University of Turku, Finland and THSTI and set-up to complement and enhance the research capabilities of its Indian and Finnish scientific networks from academia and industry in the area of diagnostics. 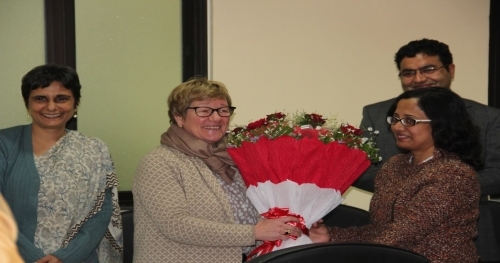 Her Excellency Ms. Nina Vaskunlahti, Ambassador of Finland visited THSTI on January 10, 2017 showing her interest in the projects going on at THSTI under this Indo-Finnish Co-operation. 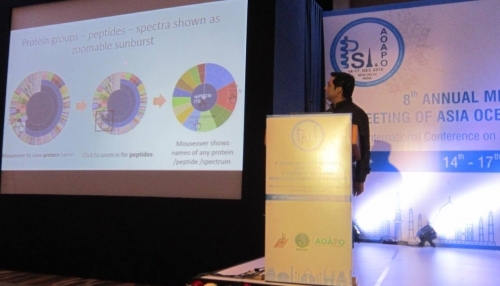 Mr. Puneet Kumar Kadimi, Research Application Developer, in DDRC, working with Dr. Amit Kumar Yadav was shortlisted for an Oral talk on his research work titled A Browser-based Interactive Dashboard for Exploratory Analysis of MS-based Proteomics data at the 8th Meeting of PSI and the 3rd Meeting of AOAPO hosted at New Delhi, India from 14-17th Dec 2016. 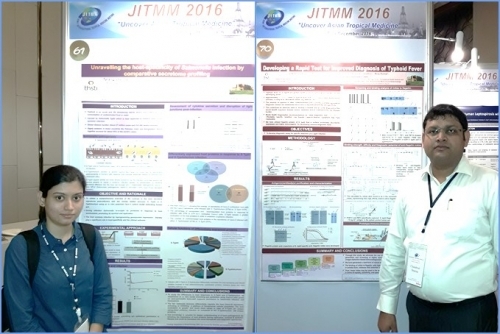 Dr. Chandresh Sharma (Innovation Awardee) and Ms. Tarang Sharma (PhD Student) at the Center for Bio-Design and Diagnostics (CBD), THSTI, have bagged the International Travel Award in the conference Joint International Tropical Medicine Meeting 2016 (JITMM-2016), Uncover Asian Tropical Medicine, from 7-9 December 2016, held at Amari Watergate, Bangkok, Thailand. Dr. Chandresh gave a Turbo talk and poster presentation on his work titled, Developing a Rapid Test for Improved Diagnosis of Typhoid Fever, while Ms. Tarang Sharma has received the JITMM 2016 Travel Grant for presenting her research work titled Unravelling the host specificity of Salmonella infection by comparative secretome profiling. 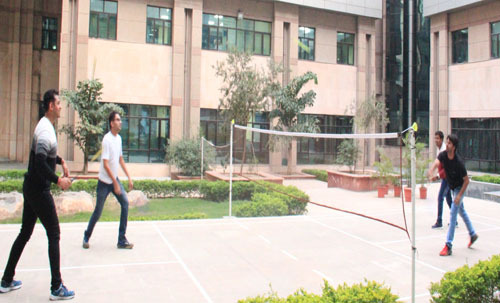 National Academy of Medical Sciences (India) is a unique institution which fosters and utilizes academic excellence as its resource to meet medical and social goals. It was registered as the Indian Academy of Medical Sciences on 21st April, 1961 under Societies Registration Act XXI of 1860. Over the years the Academy has recognized the outstanding achievements made by the Indian scientists in the field of medicine and allied sciences and conferred Fellowship as well as Membership to the selected persons through a peer reviewed process and finally voting by all the Fellows. Dr. Shinjini Bhatnagar, Dean, Clinical Research, Head, Pediatric Biology Centre has been awarded Fellow of the National Academy of Medical Sciences for 2016. 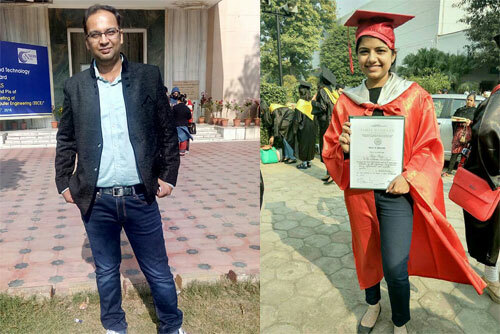 Mr. Manish Sharma and Ms. Minu Nain, Research Scholars of VIDRC Molecular Virology Lab successfully defended their PhD thesis and were awarded their degrees from Jamia Hamdard. 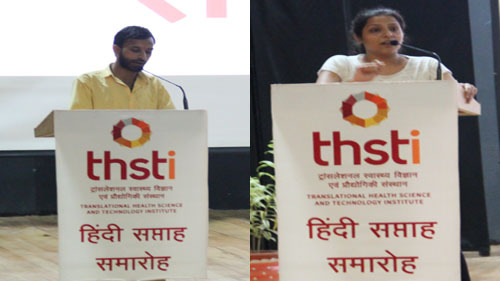 They have the proud distinction of being the first two PhD scholars from THSTI. Mr. Mrityunjay Singh, SRF, in DDRC, under the supervision of Dr. Shailendra Asthana was short listed for a talk on his research work titled “Molecular modeling of the disordered regions of Sirt-1 to understand the atomistic protein-protein interaction mechanism” in the World Congress on Drug Discovery and Development in the Indian Institute of Sciences (IISc) Bengaluru, between 23rd and 25th November, 2016. He won the “Best Presentation Award” for his presentation. Mr. Mitul Srivastava, SRF, in DDRC, under the supervision of Dr. Shailendra Asthana won “International Travel Grant” for presenting his research work titled “A protein-protein interaction approach to unravel the mechanism of protein rescue and degradation” at RSG-Germany Student Symposium on Computational Genomics in the Institute of Molecular Biology, Mainz, Germany on 29th and 30th November, 2016. His research work was highlighted as best abstract for flash presentation. THSTI filed for patent on a method of mass spectrometry for quantitatively studying multiple proteome samples (18-plex) in a single shot of mass spectrometry experiment. 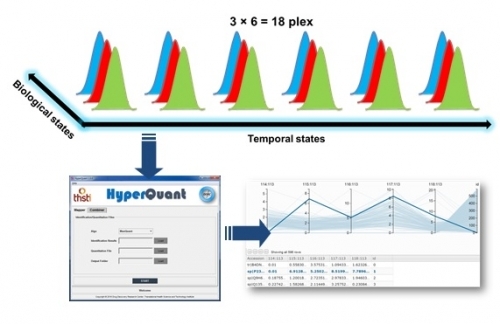 The method and informatics tools enable better, reliable, and efficient quantitation with reduced technical variability and increased multiplexing capacity at the same time. The technology is developed by DDRC team led by Dr. Amit Kumar Yadav including Dr. Ajay Kumar, Dr. Shilpa Jamwal, Suruchi Aggarwal and Dr. Kanury Rao. Nature India covers the research conducted by Dr. Awasthi’s laboratory on the association of dietary potassium with the susceptibilty of Crohn’s disease and ulcerative colitis. This study is an outcome of collaborative research between THSTI, Massachusetts General Hospital, Boston Children Hospital, Johns Hopkins Medical Centre, and Channing Division of Network Medicine. This is the first ever study suggesting extracellular potassium induced T cell tolerance by inducing the generation of Foxp3+ Treg cell in humans. The article titled “Identification and characterization of a novel association between dietary potassium and risk of Crohn’s disease and Ulcerative colitis” is authored by Hamed Khalili, Sakshi Malik, Ashwin N. Ananthakrishnan, John J. Garber, Leslie M. Higuchi, Amit Joshi, Joanna Peloquin, James M. Richter, Kathleen O. Stewart, Gary C. Curhan, Amit Awasthi, Vijay Yajnik and Andrew T. Chan. 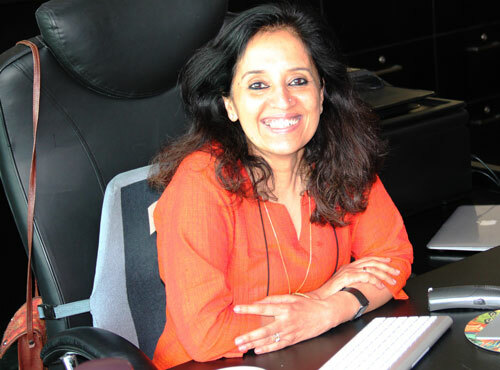 Dr. Sameena Khan of DDRC has been selected as an Associate of the Indian Academy of Sciences. The associates program was initiated by the academy in 1983 to encourage talented young scientists, below the age of 35 years, who are working in India. The intent is also to induct such young people into different programmes of the academy. Dr. Khan has also been selected for the NASI Young Scientist Platinum Jubilee Award in Biological Sciences for 2016. This award, conferred by the National Academy of Sciences, India, is in recognition of Dr. Khan’s promise, creativity, and excellence as a young scientist. The award will be presented to her during the valedictory function of the 86th Annual Session of the academy. Dr. Sameena Khan had previously also bagged the INSA Medal for Young Scientist Award in 2015. Dr. Amit Awasthi, Assistant Professor, CHME, has received the American Association of Immunologists (AAI) travel grants. The 2016 American Association of Immunologists (AAI) Early Career Faculty travel grant to attend the annual meeting of AAI in Seattle, USA. The American Association of Immunologists (AAI) travel grant to attend the International Congress of Immunology in Melbourne, Australia. BIRAC has accepted two proposals submitted by THSTI faculties under 8th call of the Biotechnology Ignition Grant BIG Scheme (1st Jan – 15th Feb, 2016). 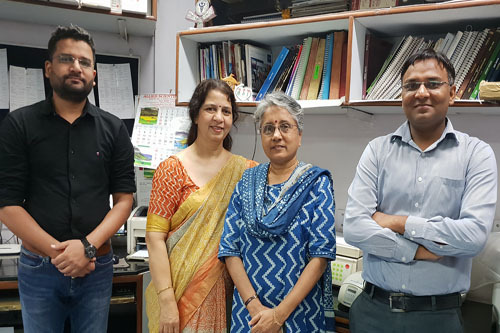 One proposal is on Strip-based Typhoid Diagnostics, through a start-up company founded by Dr. Susmita Chaudhuri and Dr. Niraj Kumar working in the Centre for Biodesign and Diagnostic (CBD), THSTI. 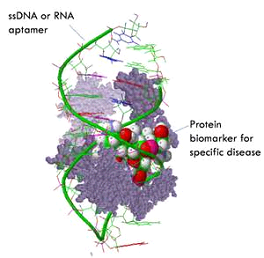 Another proposal is on aptamer-based TBM Diagnostics, from Dr. Tarun Kumar Sharma, also a part of CBD, THSTI. THSTI and AIIMS have recently filed their second provisional patent application on novel aptamers which are experimentally proved to be used efficiently against M.tb malate synthase, an enzyme essential for persistence of M.tb in human body. A team of researchers from THSTI and AIIMS led by Prof. Jaya S. Tyagi and including Dr. Tarun Kumar Sharma, Dr. Chanchal Kumar, Abhijeet Dhiman, and Ishara datta, is working on screening novel aptamers which will have application in diagnosis and treatment of Tuberculosis in Humans. The first filing under this collaborative research was in February, 2016 on novel aptamers against HspX antigen and the technology is already licensed for translation into a market ready product. Dr. Gaurav Batra (Centre for Biodesign and Diagnostics, THSTI), in collaboration with ICGEB, University of Turku, Finland and two industrial partners, has received funding from the Wellcome Trust, UK to develop a novel, multiplexed Point of Care Test (POCT) for the detection of HIV, HCV and HBV infections. Dr. Gaurav Batra is the Principal Investigator and the coordinator of this multi-institutional project. The performance of commercially available rapid POCTs for HIV, HCV and HBV is very poor compared to central lab tests (ELISA etc) and there is an urgent need for highly sensitive and specific, rapid, field-deployable multiplex tests for these blood borne infections. A multiplexed high sensitivity POCT for HIV, HCV and HBV will find utility in Emergency settings, Population screening, blood bank, STI clinics and Antenatal screening. The Drug Discovery Research Centre (DDRC), a niche Centre of the Translational Health Science and Technology Institute of the Department of Biotechnology, Govt. of India, and Revelations Biotech Pvt. Ltd. (RBPL), a Hyderabad based Research and Development Company, have entered into a research collaboration to develop new approaches for diagnosis and treatment of diabetes. The Minister of State for Science & Technology and Earth Sciences, Shri Y.S. 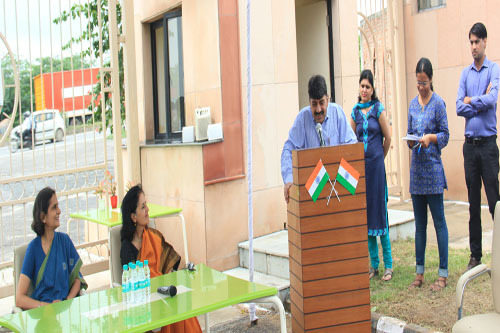 Chowdary, presided over the Memorandum of Agreement (MoA) signing ceremony which took place at Prithvi Bhawan, New Delhi. While addressing the crowd, the Minister said that India stands out as the diabetic capital of the world which is a cause of serious concern. Shri Chowdary also laid emphasis on the importance of Translational Research to facilitate translation of cutting edge research works by scientists in their labs to manufacturing low cost drugs for the masses, with sufficient contribution from the private sector. He reiterated on the importance of finding a preventive measure to diagnose and combat the incidence of diabetes at an early stage. As many as 50 million people suffer from type-2 diabetes in India. 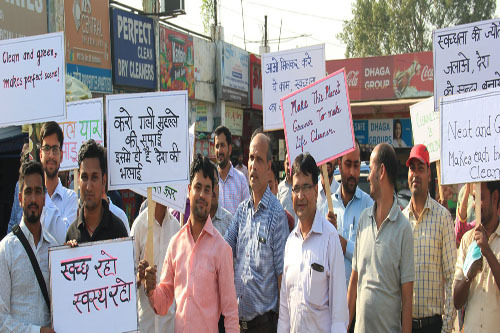 The annual expenditure for diabetes treatment in the country is to the tune of Rs. 1.5 lakh crores. Diabetes is a chronic progressive metabolic disorder of multiple etiologies that is characterized by chronic hyperglycemia with disturbances of carbohydrate, fat, and protein metabolism. Although previously thought to represent a problem of ‘middle-age’ the alarming trend seen in recent years is a rapid rise in incidence of this disease in the younger population. This is largely due to lifestyle changes where a high calorie diet is coupled with sedentary habits. Importantly, the expanding dimension of this disease emphasizes the urgent need for more sensitive methods for detection, and also for more effective regimens for treatment. 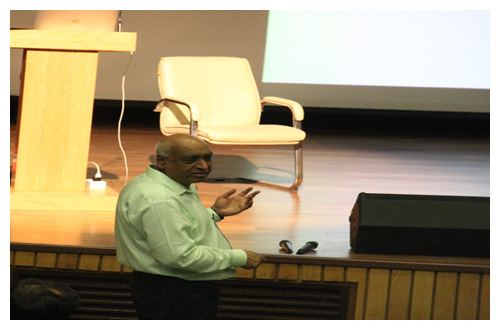 Prof. K. VijayRaghavan, Secretary, Department of Biotechnology, Govt. of India, lauded the DDRC-RBPL collaboration. He stressed that the focus on addressing these needs will be meted out through two separate programs. The goal of one of these programs is to develop a data based software package that will not only identify individuals/youth who are becoming susceptible to diabetes, but also predict future course of disease in those who are already diabetic. It is anticipated that the advance warning provided by such a system will allow the target individuals to pre-emptively make the appropriate lifestyle alterations so as to mitigate disease development, and prevent its progression. The second program is to develop a new drug that will prevent reabsorption of glucose in the kidneys. This reabsorption process contributes to maintaining the high glycemic levels in diabetics. Inhibition of this process by an effective drug therefore will lead to a significant lowering of the blood glucose level. 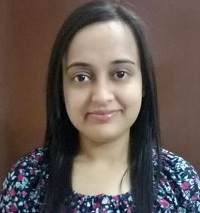 Dr. Sagarika Haldar, DST INSPIRE Faculty at the Center for Bio-design & Diagnostics (CBD), bagged the 1st prize in the poster session on Infectious Diseases in the 5th Annual Conference of the Molecular Pathology Association of India (MPAI) and International Symposium “Integration of Genetics and Genomics in Laboratory Medicine”. 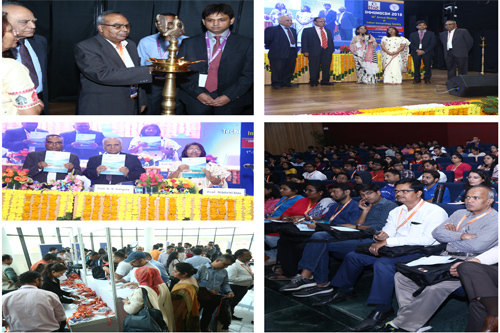 The event was held on March 12-13, 2016 at the PGIMER, Chandigarh. 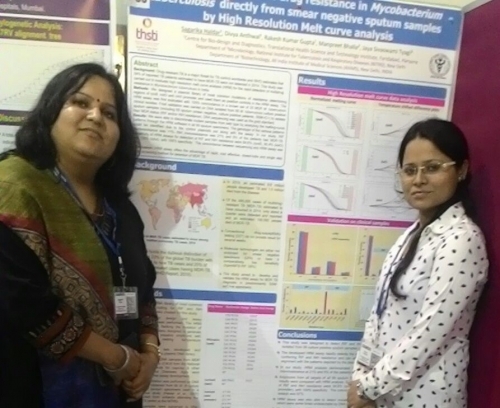 The poster, entitled “Rapid detection of multi drug resistance in Mycobacterium tuberculosis directly from smear negative sputum samples by High Resolution Melt curve analysis”, was co-authored by Divya Anthwal, Rakesh Kumar Gupta, Manpreet Bhalla, and Jaya Sivaswami Tyagi. The Drug Discovery Research Center (DDRC) of THSTI has been conferred with the prestigious Indo-US Science and Technology Forum (IUSSTF) Award, 2015. The IUSSTF, established under an agreement between the Government of India and the United States of America in March, 2000, aims to promote and catalyze Indo-US bilateral collaborations in the fields of science, technology, engineering, and biomedical research through substantive interaction between government, academia and industry. Its principle objective is to provide opportunities to exchange ideas, information, skills and technologies, and to collaborate on scientific and technological endeavor of mutual interest that can translate the power of science for the benefit of mankind at large. With this in mind, a joint proposal between DDRC and Department of Radiation Oncology, Stanford University, USA was considered under Call-II of IUSSTF, 2015, and based on peer reviews, a two-year financial support has been agreed upon for the same. The Centre for Integrative Biology of Non-Communicable Diseases (CIBN) will act as the joint center while DDRC and the Department of Radiation Oncology, Stanford University, USA will serve as the nodal host institution. 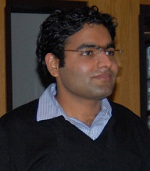 Dr. Shailendra Asthana, Scientist-C at the Drug Discovery Research Center, THSTI, Faridabad, has received the Young Investigator Award-2015 for his research work titled, “Small molecule modulation of Sirt1 activity by targeting its unstructured disordered N-terminal” at the Conference on Bioinformatics and Computer Aided Drug Design (CBCADD)-2015, recently held at IIT Guwahati, from Dec. 6-8, 2015. Dr. Asthana was also felicitated with the DST-SERB Start-Up Young Scientists Research Grant-2015 for his project titled, "Functional characterization of finger loop with/without inhibitors in HCV RNA-Dependent RNA Polymerase: A microscopic picture through computational simulations and its application for new antiviral drug development". Dr. Anurag Sankhyan and Dr. Chandresh Sharma, Innovation Awardees at the Center for Bio-Design and Diagnostics, THSTI, Faridabad, have bagged the ACBI-IFCC TFYS Young Scientist Award-2015, and M. G. I. M. S. (Sevagram) Award, respectively at ACBICON-2015, held at P.G.I.M.E.R., Chandigarh from Nov. 26-28, 2015. While Dr. Sankhyan bagged the award for his research work titled, "An array of human recombinant antibodies from naturally recovered individuals for inhibition of preS1-hepatocyte interaction", Dr. Sharma received the accolade for his paper titled “Generation of monoclonal antibodies specific to S. typhi as a potential candidate for improved typhoid diagnostics”. The event also saw another member of THSTI, Ms. Tarang Sharma, PhD Student of Dr. G. B. Nair and Dr. Ashutosh Tiwari (Center for Bio-Design and Diagnostics) being felicitated with the Organizing Committee Award for Excellent Poster Presentation for her poster titled “Development of a Robust and Efficient Diagnostic test for acute Typhoid fever”. 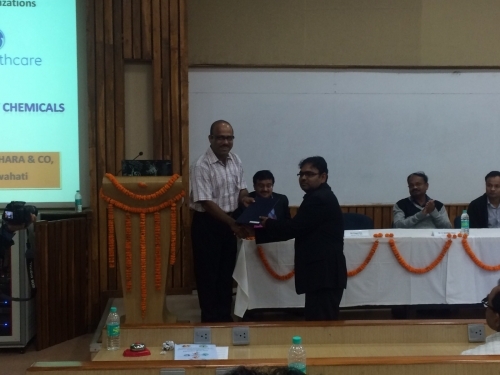 Dr. Sanjay K Banerjee, (Scientist E) at the Drug Discovery Research Center, THSTI, Faridabad, has been awarded with the prestigious Prof. Shailendra K Vajpeyee Award, 2015 for his research work titled “Role of Nitric Oxide on Hypertension in Diabetes: A Study from bench to Bed”. He presented his work at the 25th Annual Conference of the Indian Society of Hypertension (Silver Jubilee BPCON 2015, Faridabad), which was organized by the ESIC Medical College & Hospital, Faridabad from Nov. 20 -22, 2015. Dr. Banerjee is currently engaged in research to find novel targets and therapeutic interventions to reduce cardiovascular complication in diabetes at THSTI. Investigators and collaborators of the Pediatric Biology Centre won three Grand Challenges (India) Grant Opportunity awards from the Bill and Melinda Gates Foundation for the call on All children Thriving-Creating and Measuring Integrated solutions for healthy birth, growth and development. The program, managed in India through strategic partnership between BMGF-DBT and BIRAC, announced these awards during the BIRAC Innovators Meet held on 15th September 2015 at the Heritage Village, Manesar, Gurgaon. HIV researcher Dr. Suniti Solomon, who first documented to the world the prevalence of the HIV infection in India in 1986 and one who truly led research into the treatment passed away at her residence in Chennai on 28 July, 2015. One of India’s foremost HIV/AIDS researchers, Dr. Suniti Solomon was the first person to set up the voluntary testing and counseling center (VCTC) in the country. She was a pioneer in treating HIV patients since early 80s during a time when most medical practitioners were reluctant to treat HIV/AIDS patients. She founded the Y R Gaitonde Center for AIDS Research and Education (YRG CARE), a premier non-government organization set to carry out care and support center, in Chennai. She was also the Professor of Microbiology at the Madras Medical College. A pioneer in public health and HIV research, Dr. Solomon was part of several inventive HIV prevention trial research supported by agencies including the US National Institute of Mental Health, the US National Institute of Allergy and Infectious Disease. She served as the President of the AIDS Society of India. In 2012, Dr Solomon was awarded with the Lifetime Achievement Award for Service on HIV/AIDS by the MGR Medical University and in 2009; the Ministry of Science and Technology conferred her with the National Women Bio-scientist Award. 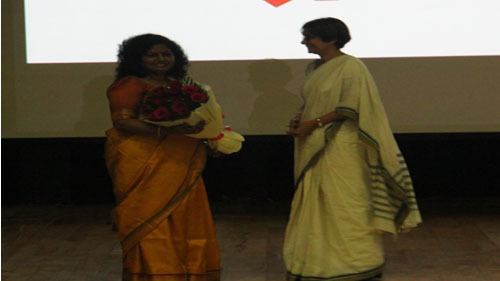 The Tamil Nadu State AIDS Control Society also had given her a Lifetime Achievement Award. She was awarded a DMS (Honoris Cusa) by the Brown University in USA in 2006. In addition, for her excellent humanitarian work, she was awarded with the Mother Teresa Memorial Award for education and humanitarian services. 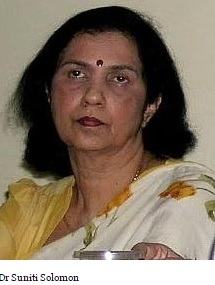 She was a fellow of National Academy of Medical Sciences (NAMS), New Delhi and had served on several boards, including National Technical Team on Women and AIDS, Advisory Board of the International AIDS Vaccine Initiative, the Scientific Committee of the National AIDS Research Institute Pune and the Microbicide Committee of Indian Council of Medical Research. Dr. Solomon’s contribution and support has immensely helped to bridge the challenging gap to implement one of the very important scientific agenda being carried out in the HIV Vaccine Translational Research (HVTR) laboratory at the Translational Health Sciences and Technology Institute (THSTI). The HVTR laboratory at THSTI is carrying out reverse vaccinology study (Protocol G), where investigators are assessing a large number serum samples and memory B cells obtained from anti-retroviral naïve slow progressing HIV positive individuals for presence of broadly neutralizing antibodies. This study will enable identify elite neutralizers and help isolate broadly neutralizing human monoclonal antibodies which then will help rational immungen design. Dr. Solomon’s support has helped recruit, retain, collect appropriate patient samples maintaining the highest ethical standards and are being screened at the HVTR laboratory through collaboration through the International AIDS Vaccine Initiative (IAVI). In the event, scientists at THSTI achieve the desired milestone; Dr Solomon’s contribution will be of paramount importance. Sphaera Pharma (India), a subsidiary of Sphaera Pharma (Singapore), and the Drug Discovery Research Centre (DDRC) of the Translational Health Science and Technology Institute have received funding from The Wellcome Trust to develop a novel, first-in-class, therapeutic for the treatment of multiple drug resistant (MDR) and extensively drug resistant (XDR) tuberculosis (TB). This is based on a unique approach, first identified at the International Centre for Genetic Engineering and Biotechnology, that targets a host protein. The approach has the potential to be more effective, and is less likely to result in development of drug-resistance. It is also expected to work in conjunction with current therapies. 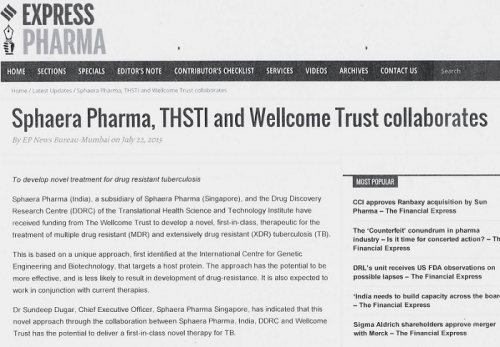 Dr Sundeep Dugar, Chief Executive Officer, Sphaera Pharma Singapore, has indicated that this novel approach through the collaboration between Sphaera Pharma, India, DDRC and Wellcome Trust has the potential to deliver a first-in-class novel therapy for TB. Dr. Kanury Rao (DDRC, THSTI), in collaboration with Sphaera Pharma (India), has received funding from The Wellcome Trust to develop a novel, first-in-class, therapeutic for the treatment of multiple drug resistant (MDR) and extensively drug resistant (XDR) tuberculosis (TB). This is a unique approach that targets a host protein and has the potential to be more effective, less likely to result in development of resistance and should work in conjunction with current therapies. Initial work towards this goal was done in ICGEB. The incidence of MDR and XDR TB are on the rise and current treatments are not very effective, with long treatment regimens and significant side effects. Hence there is urgent need for the development of new anti-TB drugs that are cheaper, easily available, more effective and require a shorter treatment period. India also has one of the worlds highest burden of tuberculosis with approximately 66000 MDR-TB (Multiple Drug Resistant TB) cases among notified pulmonary TB cases in 2011. 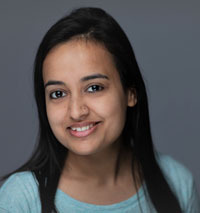 Sakshi Malik, PhD student of Dr. Amit Awasthi at THSTI has got the international travel award to attend 6th congress of Federation of Immunological societies of Asia-Oceania at Singapore (29th June - 3rd July). 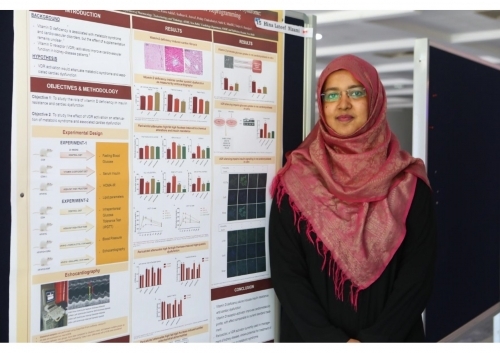 She has also been selected for International travel award by upcoming 4th European Congress of Immunology at Austria ,Vienna and EMBO meeting at Birmingham (September 6th - 9th, 2015). Dr. Amit Awasthi has been elected as member of American Association of Immunologist, 2015. Dr. Amit Awasthi has been invited as a international speaker at Academy of Immunology & Microbiology, Institute of Basic Science at Pohang University of Science & Technology (POSTECH), South Korea (October 14th, 2015). 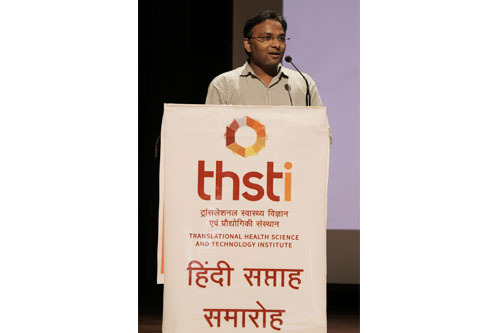 The Translational Health Science and Technology Institute (THSTI) has received its first grant from the Global Policy and Advocacy Program at the Bill Melinda Gates Foundation for creation of a "National Roadmap for targeted introduction of the available Oral Cholera Vaccine in India". The Principal Investigator for this project is Dr. G.B Nair and this roadmap created with inputs from an Expert Group on Cholera created for this purpose and will be coordinated by Dr. Sanjukta Sen Gupta from the Policy Center for Biomedical Research at the institute. Although several companies are gearing up to produce oral cholera vaccine, ShancholTM is the only available oral cholera vaccine as of now. It is WHO prequalified and manufactured in India and has been shown to be safe and efficacious both in endemic and outbreak situations in several parts of the world. Even though ShancholTM is used through private healthcare in India it is out of reach of the marginalized population of the country that is affected by cholera. A roadmap for introduction in the national immunization program will ensure its availability to the population, which needs it the most. Genetic information of a living organism is pivotal in understanding its biology. Every single gene carries a code which defines a particular function in the cell. How exciting it would be if the genes of bacteria like the one that causes cholera and tuberculosis can be studied by turning them “on” or “off” at the will of the scientists? This is not an easy task as the disease causing bacteria are often smart and are difficult to manipulate. Scientists have to outwit them by constantly developing novel tools and techniques. Two scientists at the Translational Health Science and Technology Institute (THSTI) have independently created tools that have successfully addressed this challenge. Their research work was majorly funded by the Department of Biotechnology, Ministry of Science and Technology, Government of India. 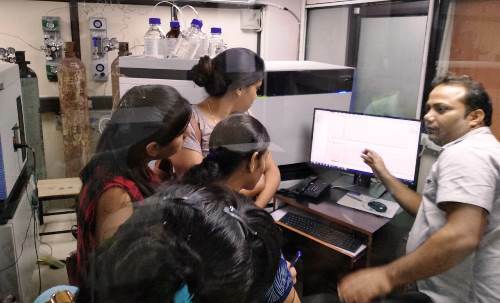 Dr. Bhabatosh Das, Assistant Professor at the Centre for Human Microbial Ecology, THSTI, and his team have successfully built a delivery tool technically called “vector” for introducing and controlling any gene that they wish to study in a range of bacteria. The scientific intelligence involved in the building of this vector termed as pBD32 (BD is abbreviation for Bhabatosh Das) is the selection of the DNA from various sources and bringing them together into one delivery system. pBD32 has a piece of DNA termed as XBS selected from a virus which in nature was known to attack the cholera bacteria and with the help of this DNA fragment goes and sits inside the bacterial chromosome. Dr. Das believed that XBS would come handy to place any gene of interest in other bacterial chromosome to turn the gene “on” or “off”. Scientifically this is termed as a stable, broad host range tightly regulated expression system that as described by Dr. Das and his team in their Journal of Bacteriology Publication (Volume: 196, Number:23, December 2014, Pages-4071-4080) could be used in several bacteria like Vibrio cholerae (causing Cholera) and Klebsiella pneumoniae (causing Pneumonia), Salmonella enterica (causing Typhoid fever), Escherichia coli (lives in human gut). Victor DiRita, University of Michigan, USA: “This clever new vector will be a great value to many researchers and I am pleased we are presenting it to the field as a paper in Journal of Bacteriology”. Dhruba Chattoraj, NIH Bethesda, USA: “You have expanded the repertoire Vc genetic toolbox by making some really useful vectors”. Christian Berens, Institute of Molecular pathogenesis, Germany: “Thank you very much for your efforts and for providing this vector to the community”. Robert Blumenthal, The University of Toledo College of Medicine, USA: “I read your J. Bacteriol paper with great interest, and believe that pBD62 could be very useful in my research on E. coli recombination”. Dr. Catherine Monahan, Cubist Pharmaceuticals, Inc. USA: “The work described in your paper is very interesting, particularly the plasmid’s ability to stably integrate as a single copy into the chromosome of different bacterial species. The capability to differentially regulate the expression of a cloned gene using the pBAD promoter in various backgrounds is very exciting”. Dr. Jeff Cox, University of California San Francisco: “it represents an exciting advance for the field”. Dr. Jiayun Liu, Johns Hopkins University: “I admire you very much for your great achievement in this field”. Dr. Dirk Schnappinger, Weill Cornell Institute: “Congratulations on your recent paper in Nature communications. Very nice work”. Dr. Sarah Stanley, University of California, Berkeley: “Congratulations on this excellent publication of a breakthrough technology for those of us in the M. tuberculosis field. 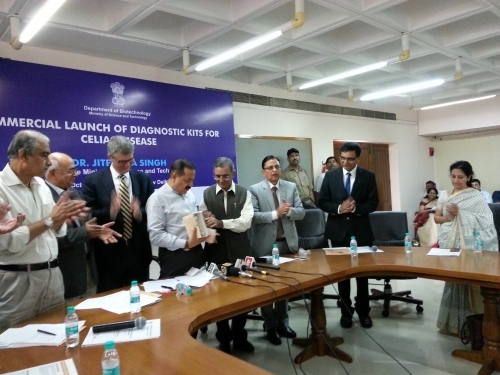 A diagnostic kit for celiac disease developed jointly by THSTI, ICGEB & AIIMS sponsored by DBT, has been launched by the Honble Science and Technology minister Dr. Jitendra Singh in a ceremony on 28th Oct. Please find the press release of the program. 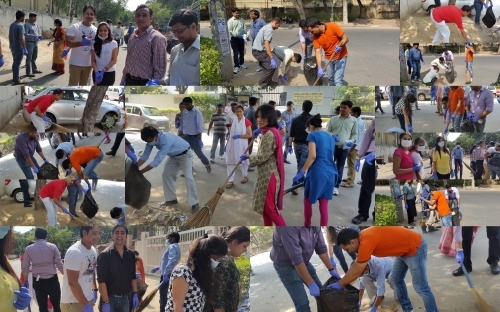 THSTI observed "Swachhta Divas" on 2nd October, 2014. 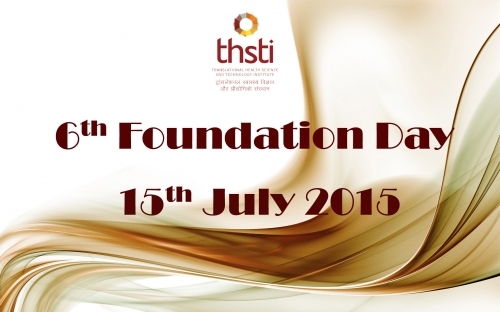 THSTI celebrated its 5th Foundation Day on July 15th. 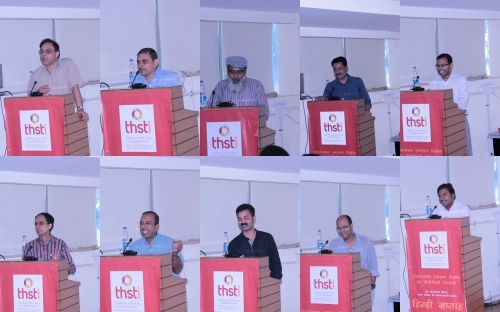 The occasion was celebrated with grand enthusiasm by the THSTI community along with our donors, collaborators and well wishers. 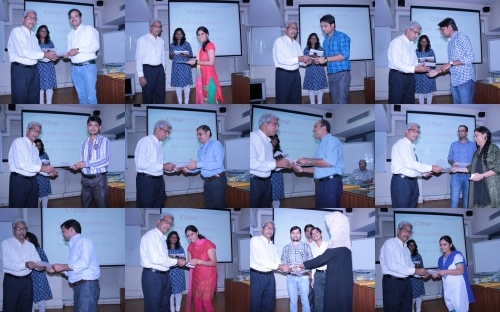 The Foundation Day pre-ceremony was marked by poster competition by students/fellows from research organizations of Delhi-NCR, quiz and debate by THSTI students, faculty and administrative personnel. 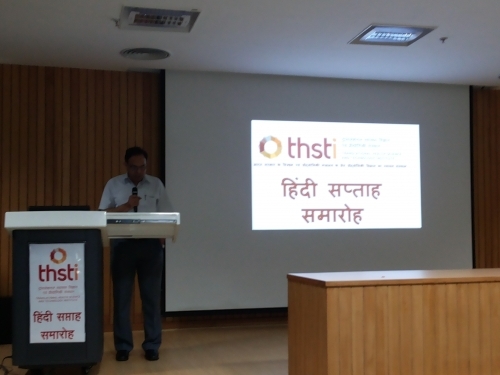 The evening started with the presentation of a report on THSTI by our Executive Director, Prof. G.B.nair. 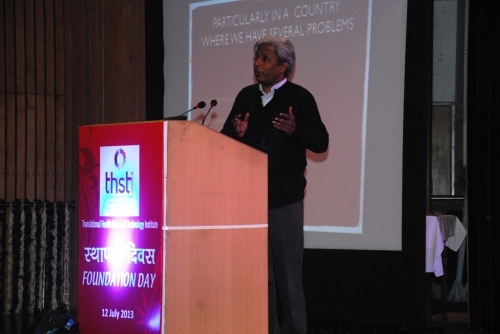 Keynote address was given by Secretary DBT, Prof K. Vijayraghavan. DBT perspective on THSTI was shared by Dr. T.S. Rao (Senior Advisor, DBT). Prof. M.K.Bhan presented the perspectives of our Scientific Advisory Group of Experts (SAGE). Dr. T.S. 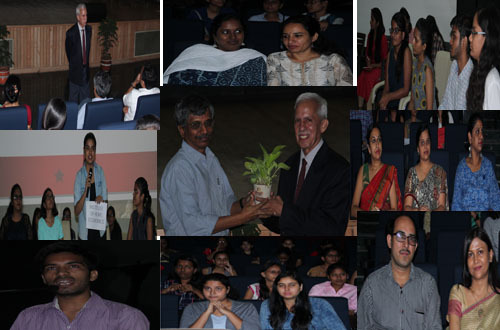 Balganesh, Distinguished Scientist, OSDD-CSIR, delivered the Foundation Day oration. Dr. G. Balakrish Nair, Executive Director, THSTI and Dr. Yoshifumi Takeda, Kyoto University, Japan has recently published Cholera Outbreaks in electronic and print format with Springer�s. This book provides a better understanding of cholera outbreaks. The most feared attribute of the human pathogen Vibrio cholerae is its ability to cause outbreaks that spread like wildfire, completely overwhelming public health systems and causing widespread suffering and death. This volume starts with a description of the contrasting patterns of outbreaks caused by the classical and El Tor biotypes of V. cholerae. Subsequent chapters examine cholera outbreaks in detail, including possible sources of infection and molecular epidemiology on three different continents, the emergence of new clones through the bactericidal selection process of lytic cholera phages, the circulation and transmission of clones of the pathogen during outbreaks, and novel approaches to modeling cholera outbreaks. A further contribution deals with the application of the genomic sciences to trace the spread of cholera epidemics and how this information can be used to control cholera outbreaks. The book closes with an analysis of the potential use of killed oral cholera vaccines to stop the spread of cholera outbreaks. In consonance with the directives received from the Department of Biotechnology (DBT), THSTI has started publishing their tenders through e-Procurement module of CPP portal. 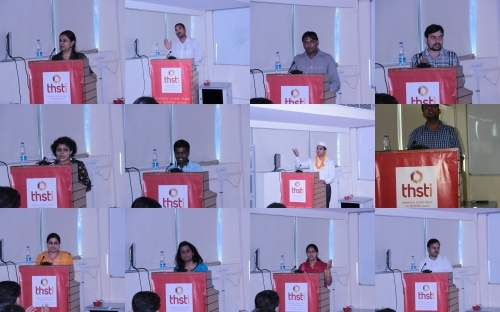 A formal function was held on 7th July, 2014 for the introduction of e-Procurement module at THSTI for which Dr. T.S. 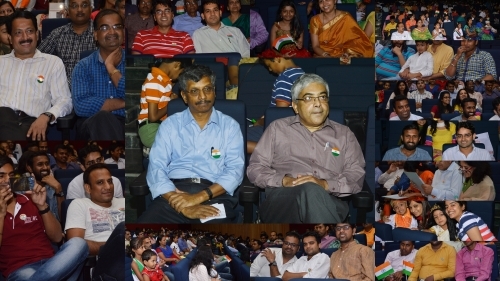 Rao, Senior Adviser, DBT was the chief guest. Dr. G. B. Nair, Executive Director, THSTI welcomed the gathering and explained the need for e-Procurement in government organisations. He stated that e-procurement not only makes the system transparent and efficient, it also instils confidence among the vendors in the tendering system. Dr. T.S. Rao clarified that the government of India is monitoring the progress of the National e-governance plan (NeGP) and stated that e-Procurement is an important module under its mission mode project. He congratulated Mr. M.V. Santo, Head-Administration and his team for this achievement of introducing e-Procurement in THSTI. Dr. T.S. Rao clicked the �publish tender� button under the e-Procurement module of CPP Portal to publish a tender for the purchase of an Ultrasound Machine for the �Paediatric Biology Centre� of THSTI. Dr. Guruprasad Medigeshi, an Assistant Professor at the Vaccine and Infectious Disease Research Centre, THSTI, has received the Intermediate Fellowship by Wellcome-DBT India Alliance. His research proposal attempts to understand the dynamics of zinc influx and efflux mediated by zinc transporter proteins during viral infections and to assess if changes in zinc homeostasis has any bearing on the pathogenesis and disease outcome. Majority of childhood infections have viral etiology and pediatric illnesses caused by viruses such as dengue, respiratory syncytial virus and rotavirus are leading cause of child mortality worldwide. A number of clinical trials have been conducted with zinc supplementation as an adjunct in the treatment of some of these infections with conflicting results. There is a need to understand the mechanism of interaction between viral infections and zinc homeostasis in order to develop better therapeutic supplementation strategies using zinc. Dr. Medigeshis research is expected to bring great insights into this field. 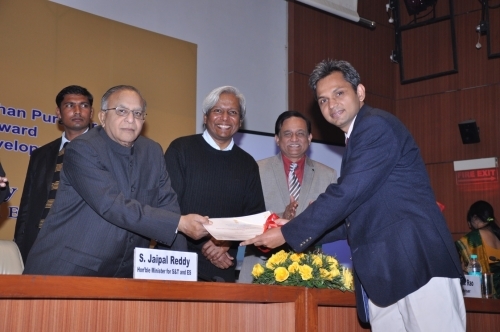 Dr. Jayanta Bhattacharya received the prestigious National Bioscience Award by Department of Biotechnology this year. He is a Principal Scientist II (Research and Development) at the International AIDS Vaccine Initiative, India. As a Principal Investigator at the HIV Vaccine Translational Research Laboratory (HVTR), Gurgaon, a collaborative endeavor of the Translational Health Science & Technology Institute and International AIDS Vaccine Initiative, he is working on discovery of novel broad and potent antibodies from Indian patients using reverse vaccinology. The Dutch Delegates including Jos Smits, Director Centre for Research Innovation, Support and Policy (CRISP), Dean for Research of FHML at Maastricht University, Professor of Pharmacology, Dorine Collijn , Head of Research Policy Department (CRISP), Shyam Vasudevarao , Technical Director Faculty of Health, Medicine and Life Sciences , Maastricht University visited THSTI to strengthen Indo�Dutch collaboration and initiate research programs with THSTI investigators. An overview of their strengths and existing activities was presented by Jos Smits. 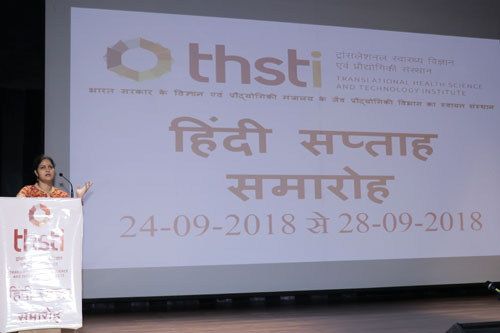 The Delegates had shown particular interest in the following activities at TSHTI: The Centre for Biodesign, the Centre for Human and Microbial Ecology and the Policy Centre for Biomedical Research. Faculty and Scientists of THSTI also actively participated during the discussion about the future prospects of collaboration between MUMC and THSTI. Discussion ended with a positive note for finding grounds of collaborative work to be carried out between the two institutes. Yakult India Microbiota and Probiotic Science Foundation in association with the Translational Health Science and Technology Institute, Gurgaon and Apollo Hospitals organized the probiotic symposium , � Probiotics, Microbiome and Gut function � Transforming Health and Well-being on 15th and 16th February 2014 at the Intercontinental Eros Hotel, Nehru Place, New Delhi, India. The programme of the symposium was especially designed to unravel the factors that shape the microbial communities of the gut and identify the latest developments in probiotic science that will positively affect the microbiota for clinical intervention. Keynote lectures by leading International and national experts allowed a better understanding of the matrix for probiotic delivery , mechanism of action of probiotics, the role of probiotics in preventing infections and an insight into the Alimentary Pharmabiotic Centre that serves as a model of how scientists, clinicians and industry can work together with shared goals. 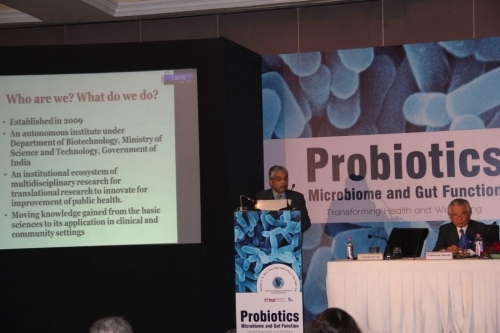 An insight into the epidemiological studies conducted on probiotics and the integration of probiotics in day to day clinical and nutritional practice were also some exciting highlights of the symposium. This symposium brought together International and National experts and captured the latest findings on the growing science of the Gut Microbiota and the role of Probiotics for improvement of health and well-being. Welcome address speech were delivered by Prof N. K. Ganguly, Distinguished Biotechnology Research Professor, Department of Biotechnology, Ministry of Science and Technology, Government of India, Prof. G. Balakrish Nair, Executive Director, Translational Health Science Technology and Institute and Prof. Anupam Sibal, Group Medical Director and Senior Consultant Pediatric Gastroenterologist and Hepatologist, Apollo Hospitals. During the symposium Prof. Yoshifumi Takeda, Emeritus Member, National Institute of Infectious Disease, Toyama, Shinjyuku, Japan was honored with Lifetime Achievement Honour award. 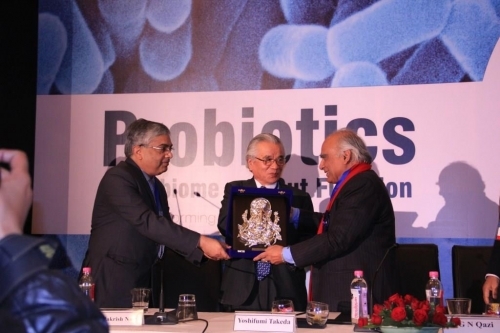 Recognizing the need to promote probiotic research in the country, the Foundation instituted three young Investigator awards to felicitate talent and knowledge. THSTI felicitated Prof Mathuram Santosham for receiving the prestigious Albert B.Sabin Gold Medal. The felicitation was done by THSTI Executive Director Dr. GB Nair in presence of all the faculty, scientists and scholars of THSTI. Prof. Mathuram Santosham, M.D., is a professor of Pediatrics and Pediatric Infectious Diseases at Johns Hopkins, and director of both its Health Systems Program and Center for American Indian Health, Johns Hopkins Bloomberg School of Public Health. He is a renowned expert in oral rehydration therapy and has conducted numerous clinical trials in the U.S. and worldwide on the safety and efficacy of oral rehydration therapy and gastroenteritis. Albert Sabin Gold Medal is the highest scientific honor given by the Sabin Vaccine Institute and commemorates the legacy of the late Dr. Albert B. Sabin. This prestigious award is presented by the Sabin Vaccine Institute (Sabin) as part of the National Foundation for Infectious Diseases (NFID) annual conference. Dr. Shinjini Bhatnagar Professor and Dean (Clinical Research) was also requested to speak a few words and she congratulated Prof Mathuram Santosham on receiving the award and expressed her happiness. It was delightful to hear Prof Santosham sharing his journey of a scientific career in the most humble way and also thanking THSTI for felicitating him. 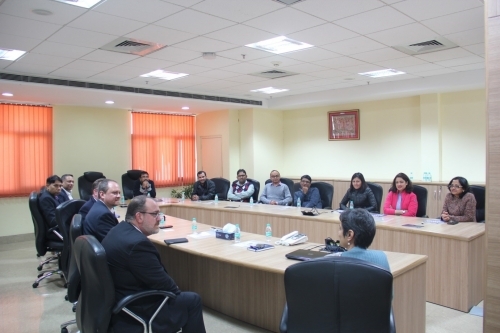 The Dutch Delegates from the Erasmus University Medical Centre visited THSTI to strengthen ties with Indo�Dutch collaboration and also to initiate collaborative work with THSTI. 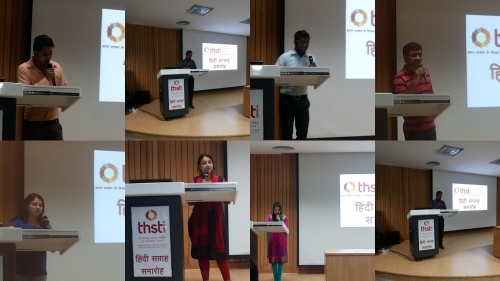 Dr. Nair, Executive Director THSTI and Dr. Shinjini Bhatnagar Professor and Dean (Clinical Research) highlighted about the research activities taking place at THSTI and also talked about possible ground of collaborations. 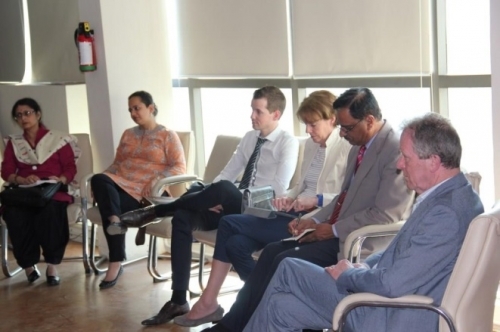 The Delegates who visited THSTI were Prof Gabriel Paul Krestin, Professor and Chairman Radiology Department , University Medical Center Rotterdam , Prof. Hans vander Steen , Program Director, Neuroscience, Dr M.Arfan Ikram Associate Professor , Department of Epidemiology, Radiology and Neurology , Mr J.W. 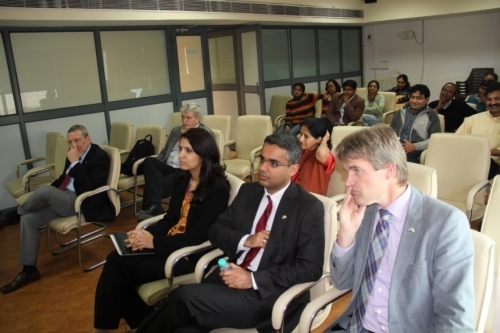 (Jelle) Nijdam Counsellor, Head of Science and Technology Department, Embassy of the Kingdom of the Netherlands, New Delhi and Ms Akansha Sharma , Policy Officer, Science and Technology, Embassy of the Kingdom of Netherlands, New Delhi. There were discussions about collaboration between the two Institutions. Prof. Krestin and Prof. Steen showed keen interest in following up for future collaborative research activities between UMCR and THSTI. 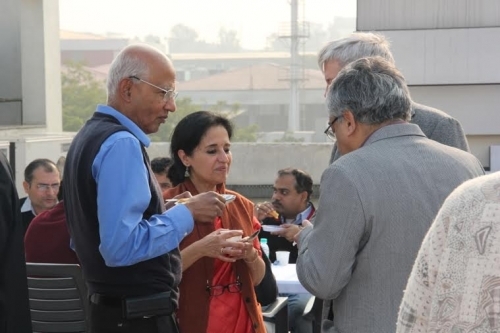 Faculty and Scientists of THSTI also participated during the discussions. 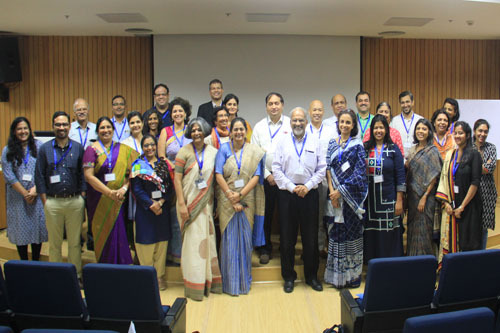 THSTI's journey on the translational road-map got a significant boost with the initiation of the program on pre-term birth, which is the first inter-institutional program on maternal-fetal-infant health in India funded by DBT under the Grand Challenge Program. It is a multi-institutional & multidisciplinary research effort to predict & diagnose Preterm Birth (PTB) by elucidating the biology of maternal-fetal-neonatal physiology. The research outputs are expected to define biological, clinical and epidemiological risk factors to achieve appropriate risk stratification of mothers at risk of premature delivery. The program also has an in-built component of providing leads for novel interventions and their implementation in population. This program has important public health implications for our country where 3.6 million are born preterm, and over 300,000 of them die each year. India, contributes to the highest number of PTB and deaths worldwide, specifically 25% of the overall global preterm related deaths. Despite the introduction of many new therapies for prevention of PTB, the problem persists. These babies who are born early are more susceptible to infections, have higher mortality and have substantial long-term problems in their late childhood and adult life. 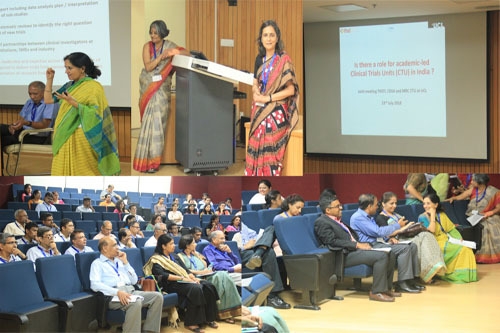 The inter-institutional and multi disciplinary profile of the programme is evident as it involves clinicians, epidemiologists and biologists from the three autonomous DBT institutes, the Paediatric Biology Centre (PBC), and the Centre for Human Microbial Ecology (CHME) at the Translational Health Science and Technology Institute (THSTI), the Regional Centre for Biotechnology (RCB), and the National Institute of Biomedical Genomics (NIBMG). 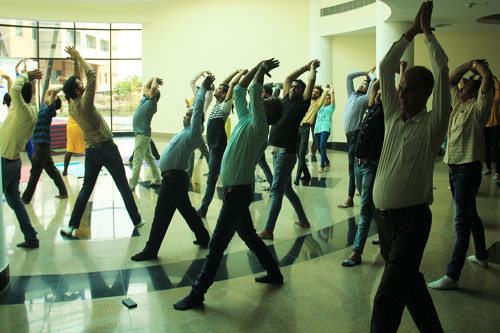 The other important partners are the clinicians at the General Hospital Gurgaon and Safdarjung Hospital. The physicians from Maulana Azad Medical College and All India Institute of Medical Sceinces are co-investigators in the program. Pediatric Biology Center, is the main coordinator of the programme and the project management will be implemented by the Clinical Development Services Agency, an extramural unit of THSTI. THSTI has entered into a collaboration with Centre for Health Research and Development, Society for Applied Studies (CHRD-SAS - a not for profit Scientific and Industrial Research Organization, dedicated to community health research). 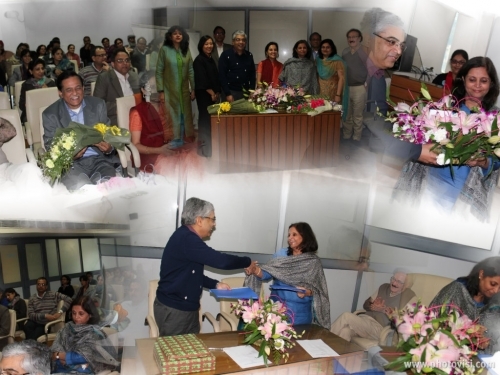 A MoU effecting the collaboration was signed at THSTI by Dr. Nita Bhandari (CHRD �SAS) and Dr. G.B. Nair (THSTI). Under this collaboration the two institutions will pursue collaborative research and innovation in population based science, focused on development, evaluation and diffusion of affordable technologies and solutions for improved health and nutrition. The collaboration will emphasize solutions and technologies of public health importance to India and to the poorest. And also promote utilization of under-used existing technologies through appropriate modification and evaluation work in partnership for translational research and permit their respective scientists to collaborate on scientific projects. The collaboration is in synergy with the objectives of THSTI. Dr. Amit Awasthi, Assistant Professor at THSTI, has received the Innovative Young Biotechnologist award from the Department of Biotechnology. 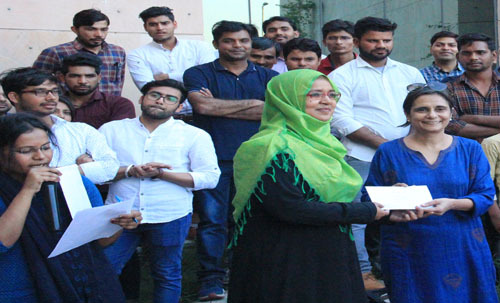 This coveted award is given to nurture outstanding young scientists with innovative ideas and desirous of pursuing research in frontier areas of biotechnology. Dr. Amit Awasthi is an immunologist with research focus on discovering underlying mechanisms of Inflammatory Bowel Disease (IBD). His major thrust area of research at the Centre for Human Microbial Ecology, THSTI is to understand the regulations of effector and regulatory T cells in IBD, especially, how IL-27 regulates Th17 cell response and enhances Tregs functions in gut inflammation. His research aims to open new avenues for development of therapeutic strategies in IBD. 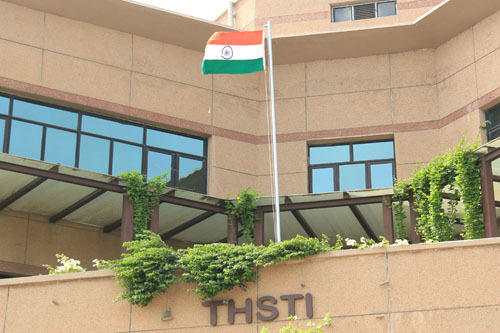 In June 2013, Jawaharlal Nehru University (JNU) accorded recognition to the THSTI academic program leading to the award of the PhD degree. An MoU to this effect was signed on 30th September 2013 on behalf of the two institutions by Prof. S. K. Sopory, Vice-Chancellor, JNU and Dr. G. B. Nair, Executive Director, THSTI at the JNU campus in New Delhi. 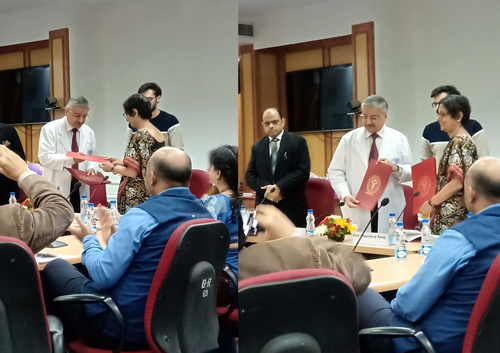 The MoU provides for the enrollment of THSTI research students at JNU for their PhD degree. It extends to collaborative use of scientific expertise and infrastructure between the two institutions and also to the participation of THSTI faculty in the proposed integrated M.Sc.-Ph.D. course at the Special Center for Molecular Medicine, JNU. 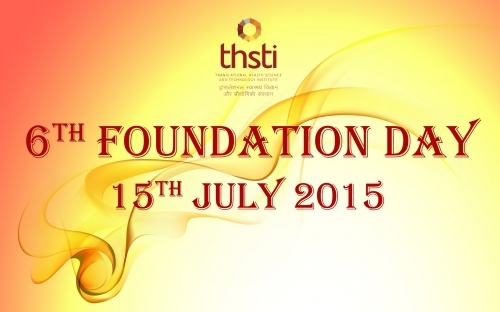 THSTI celebrates the Fourth Foundation Day. 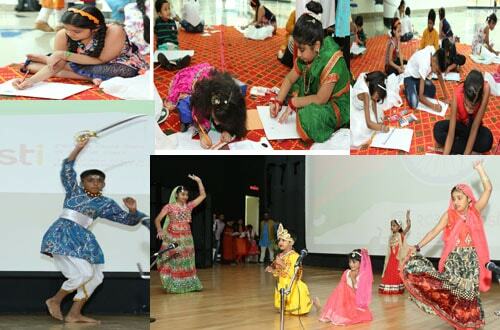 The Institute celebrated its traditional Foundation Day on12th July 2013. 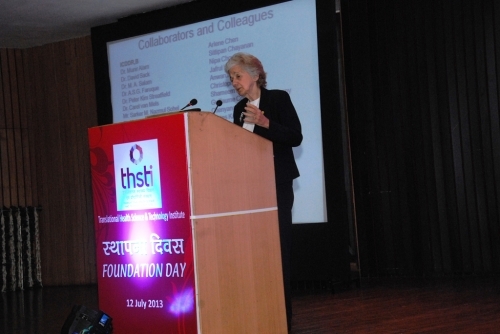 THSTI's Foundation Day Address was made by Dr. Rita Colwell, former Director, US National Science Foundation. Dr. M.K. Bhan, Distinguished Professor, Ministry of Science and Technology, GoI, delivered the Keynote address. 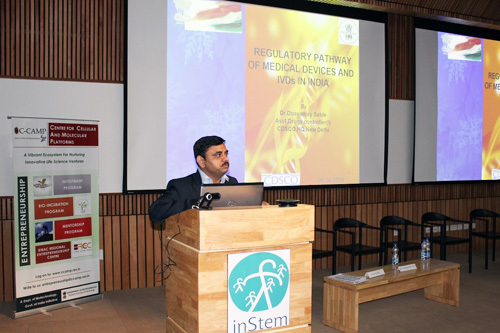 The Chairman's address was delivered by Prof. K VijayRaghav, Secretary, Department of Biotechnology, Government of India. Dr GB Nair, Executive Director, THSTI, highlighted the milestones achieved in fulfilling the Institute's mandate, since inception. THSTI has entered into a collaboration with the International Centre for Diarrhoeal Disease Research, Bangladesh (icddr,b) . A MoU effecting the collaboration was signed at Dhaka, by Dr. John Clemens (icddr,b) and Dr. G.B. Nair (THSTI) on 3rd July 2013. Under this collaborations the two institutions will permit their respective scientists to collaborate on scientific projects. Icddr,b, has a mission to �develop and promote realistic solutions to major health, population and nutritional problems facing the poor people of Bangladesh and other settings�. The collaboration is in synergy with the objectives of THSTI. JNU Recognizes Doctoral Program at THSTI. The Executive Council of the prestigious Jawaharlal Nehru University (JNU), recently accorded recognition to the THSTI doctoral program leading to the award of the Ph.D degree. The recognition comes within the purview of Clause 5(13) of the JNU Act. It opens another avenue for registration with a acclaimed university, for research fellows pursuing their doctoral studies at THSTI." 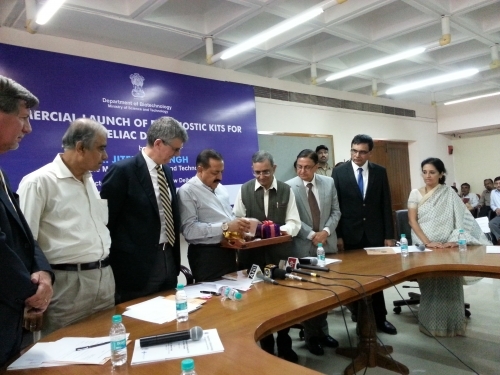 The goal of the Indo-Finnish Diagnostic Research Centre (IFDRC) is to complement and enhance the research capabilities of its Indian and Finnish scientific networks from academia and industry in the area of diagnostics. This collaborative effort between India and Finland is set to enable innovation and facilitate collaboration in diagnostic research and development between academic and industrial players in both countries. The two countries, through Translational Health Science and Technology Institute (THSTI) under Indian Ministry of Science and Technology and University of Turku, Turku, Finland have agreed that the center has two locations: one at THSTI, Delhi and one at the University of Turku." Ongoing research on Rotavirus at the VIDRC, THSTI received mention in a Press Release by DBT recently. It recognizes the contribution of the Rotavirus Laboratory, led by Dr. Sudhanshu Vrati, in the development of the ROTAVAC vaccine through social innovation partnerships. The vaccine when released will be useful in the control of diarrhea, afflicting infants. The vaccine is a more affordable alternative to existing Rotavirus vaccines . It could be a boon to child care in low resource countries". 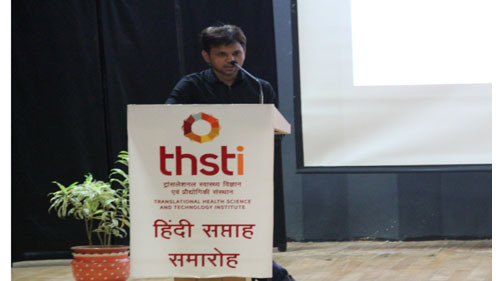 C-TRIUMPH, Dr. Nisheeth Agarwal, Assistant Professor at THSTI is now a member of a team of 39 eminent TB researchers. Dr. Nisheeth Agarwal, Assistant Professor at THSTI is now a member of a team of 39 eminent TB researchers from USA and India on a prestigious grant, �INDO-U.S. Vaccine Action Program (VAP), on tuberculosis research�. The award was announced on 10th April, 2013 The program aims to establish Cohort Research Units (CRUs) involving clinical sites, and TB research laboratories to address fundamental research using clinical samples. The project led by Dr. Soumya Swaminathan, National Institute of Research in Tuberculosis, Chennai, India and Dr. Amita Gupta, Johns Hopkins University, Baltimore, USA. They intend to establish a fully developed CRU (fCRU), titled C-TRIUMPH - Cohort for TB Research Indo-US Medical PartnersHip in India. C-TRIUMPH is a collaborative consortium, with five year tenure. Eight premier institutions in India and USA form the consortium. Its objectives are to investigate various host and microbial factors associated with progression of TB through different stages. 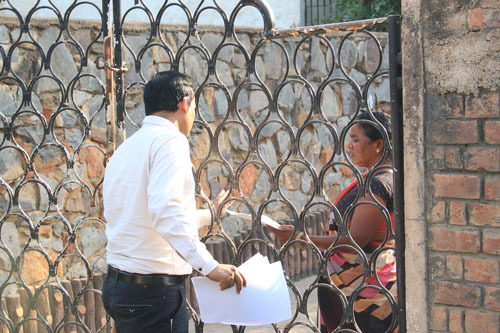 Dr. Agarwal will study signatures of latency and active tuberculosis in the Indian population. He will co-chair the Biomarkers and Diagnostics Scientific Working Group (SWG), one of the five SWGs proposed in the fCRU. India with 40% of its population exposed to Mycobacterium tuberculosis, has two million people developing the active TB disease annually. In India, TB accounts for 26% of the world�s burden for the disease. The C-TRIUMPH project conforms to the international roadmap for tuberculosis research. The project is jointly funded by Government Departments in USA and India. Dr. Agarwal did his M.Sc in Biotechnology from Banaras Hindu University and Ph.D. in Biochemistry from the University of Delhi. He went on to do his postdoctoral fellowship from the Centre for Tuberculosis Research at the Johns Hopkins University in Baltimore, USA. He took up appointment at THSTI as assistant professor in 2010. His laboratory currently works on essential signaling molecules of M. tuberculosis and their role in growth and virulence of the pathogen. The THSTI fraternity mourned the untimely and sudden death of Prof. Sanjay Biswas, at a condolence meeting in his memory at THSTI on April 29, 2013. Prof. Biswas was a member of the Governing Body of THSTI. His vast experience in the field of engineering and capability to bond with people was evident from the discussions during the meetings. 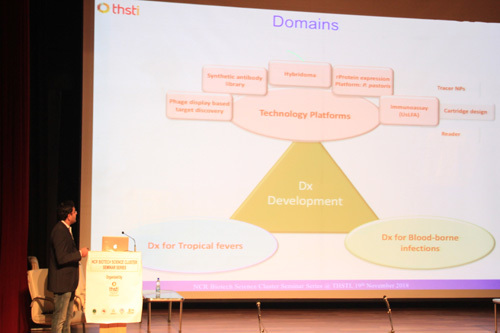 Prof. Biswas had recently, taken over as a National Chair at THSTI. True to his character he, rapidly embarked on a very ambitious project of planning biodesign and bioengineering laboratories at Center for Biodesign. Prof. Biswas was one of the cardinal members of the strategic team articulating the vision for the National Biodesign Alliance, anchored by THSTI. He had an infectious, childlike enthusiasm, but was meticulous in carefully charting the last detail of projects he undertook. His years of experience and knowledge were brought to bear in all endeavors. He was very quietly confident that he would be able to attract the best of talent globally to create a world-class center for Biodesign and bioengineering at THSTI. We extend our heartfelt condolences to the bereaved family, colleagues and admirers of Prof. Biswas at this hour of grief. The void left by the demise of Prof. Biswas, will take a long time to fill, if at all. 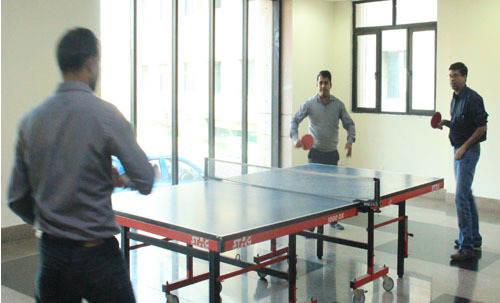 The Department of Biotechnology, Govt. of India and Ministry of Science and Technology, Govt. of Socialist Republic of Vietnam has singed a Programme of Cooperation in the area of biotechnology. In this connection, a four member delegation led by Dr. Dao Ngoc Chien, Deputy Director General of High Tech Department of MoST, Govt. of Socialist Republic of Vietnam visited on 12th September THSTI to discuss possible areas of collaboration. NEW DELHI�On Monday, India opened a $12 million, government-backed laboratory whose mission is to create a new vaccine against HIV. 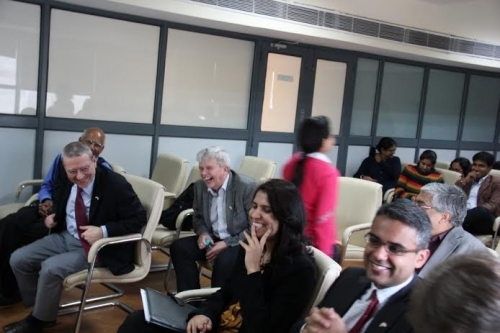 The HIV Vaccine Translational Research Laboratory, which aims to recruit about 30 scientists, is embedded within the Translational Health Science and Technology Institute, a $200 million facility under development on the outskirts of New Delhi. It will work in collaboration with the New York based-International AIDS Vaccine Initiative (IAVI); operating costs will be shared equally. India has the world's third largest burden of AIDS, despite the fact that "HIV infections have declined by 56% during the last decade, from 270,000 in 2000 to 120,000 in 2009," says India's health minister Ghulam Nabi Azad. He says there is a desperate need for a vaccine against HIV. "Designing a new broad-spectrum HIV vaccine will be the mandate of this new lab," says Margaret G. McGlynn, CEO of IAVI. The goal is achievable, she says: "Researchers have long known that after a few years of infection, a minority of HIV-positive people produce antibodies that can neutralize a broad spectrum of HIV variants." The aim is to find a suitable broad spectrum antibody for the purpose. McGlynn says the plan is to make and test a vaccine in India, which she says is "suitably placed with its talented scientific manpower, well-established pharma industry, and a huge commitment from the government." Dr. Amit Awasthi, Selected for National Academy of Science of India. 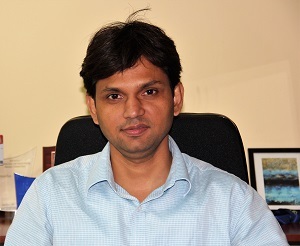 Dr Amit Awasthi, Asst Professor, THSTI, has been selected for the National Academy of Sciences of India - Young Scientist Platinum Jubilee Award 2012 in the field of Bio-medical, Molecular Biology and Bio-technology. Dr. G.B. Nair has been posted as the Executive Director of Translational Health Science and Technology Institute, Faridabad, which is an autonomous institute of Department of Biotechnology under Ministry of Science and Technology, Govt. of India. Dr Nair is an internationally renowned Scientist who has done extensive research in the field of Diarrheal Diseases particularly on cholera. He has many publications and patents to his credit. Dr. G.B. Nair was earlier the Director of National Institute of Cholera and Enteric Diseases (NICED), Kolkata. He has held various other postings in India and abroad including that of the Director of the Laboratory Sciences Division in the International Centre for Diarrhoeal Diseases Research, Bangladesh. G.N. Ramachandran Gold Medal for Excellence in Biological Science & Technology to Dr. Dinakar M. Salunke. Gold Medal for excellence in Biological Sciences & Technology Instituted by the Council of Scientific & Industrial Research (CSIR) in the memory of Prof G N Ramachandran, has been announced for the year 2010 to Dr. Dinakar M Salunke. Dr Salunke has been awarded this medal for his outstanding contributions in understanding of the generation of antibody diversity and the processes by which antibodies change shape for interactions with antigens. he HIV Vaccine Translational Research (HVTR) Laboratory at THSTI, in collaboration with the International AIDS Vaccine Initiative (IAVI), a global non profit, is steering efforts to design a preventive vaccine against HIV. “Where prevention is concerned, this is one of the cleverest viruses we have ever seen. It can develop so rapidly that it can get past any immune defences. It is a virus that attacks the immune system, so it needs to figure out most quickly how to protect itself from the immune system and it does that by rapidly mutating. This is why this research is so important,” said Prof Gagandeep Kang, Executive Director, THSTI, while speaking to the Indian Express.